Big brother. Step one: Take HTC's successful One smartphone and blow it up to a gigantic 5.9-inches with Full HD resolution. Step two: Add a swift Qualcomm Snapdragon 600 quad-core with an integrated Adreno 320 graphics card. Step three: Blend in 2 GB of RAM, 16 GB of storage, a big 3300 mAh battery and a fingerprint scanner. HTC's new One Max is complete. 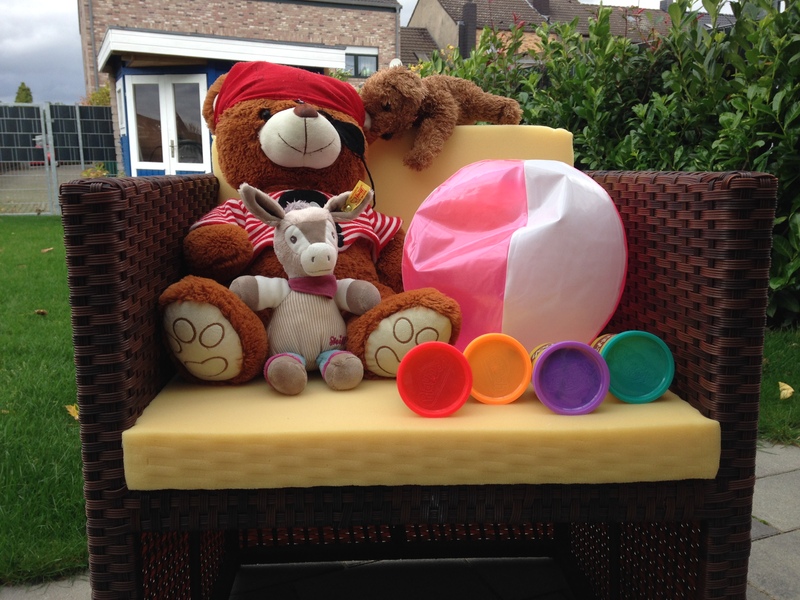 Is this recipe enough for a podium placement in the phablet category? "...more everything" is how the Taiwanese manufacturer self-confidently captions its new HTC One Max on the product webpage. The Asian producer is not resting on the success of its previously launched HTC One and HTC One Mini models and completes its One family with a phablet dubbed One Max. 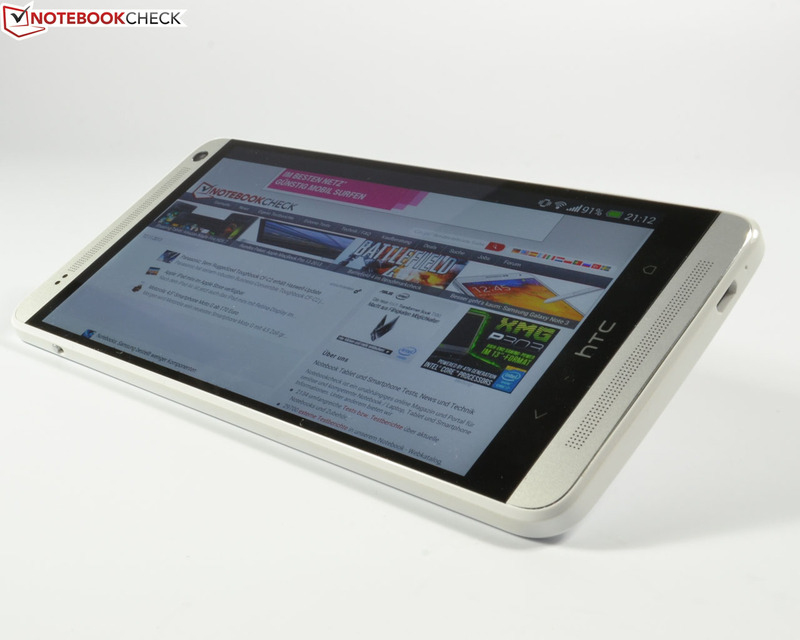 HTC treats it to a bright, 5.9-inch SuperLCD 3 screen with a resolution of 1920x1080 pixels (Full HD). The One Max is powered by a cutting-edge Qualcomm Snapdragon 600 APQ 8064T quad-core SoC that clocks with 1.7 GHz alongside a big 2 GB DDR2 working memory. The integrated Adreno 320 GPU takes care of graphics. Besides that, a 16 GB flash memory (net: 11 GB) is also installed. The latest Android version 4.3 runs on the One Max. HTC pairs it with its own Sense 5.5 interface. A 3300 mAh lithium battery ensures long runtimes despite the large screen. 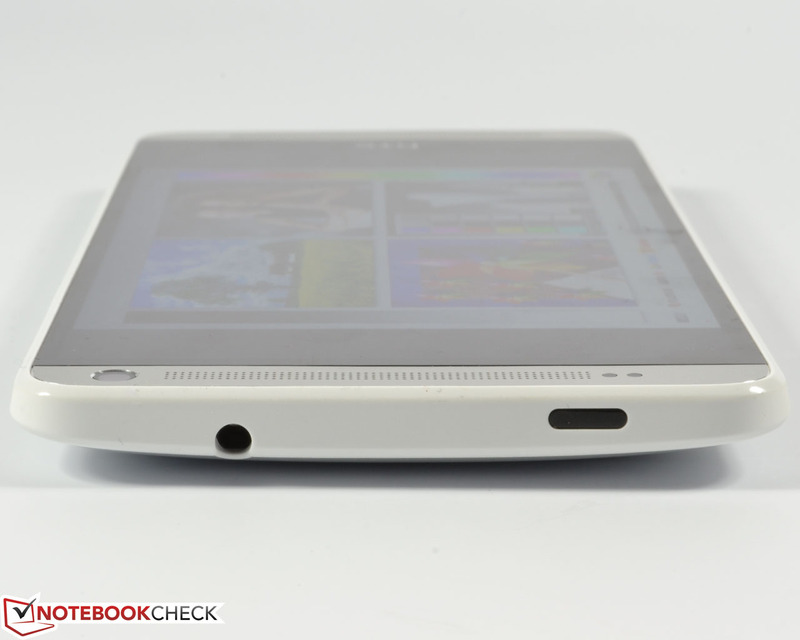 Like in HTC's One, front-facing stereo speakers provide decent sound. A fingerprint scanner located below the camera increases security. The HTC One Max radiates premium flair, which the recommended price of 699 Euros (~$943) also underlines. Our in-depth review reveals whether this interesting idea will spark and how the review sample fares against contenders like Huawei's Ascend Mate, Samsung's Galaxy Mega, Sony's Xperia Z Ultra and the current leader in our Top Ten of November 2013, Samsung's Galaxy Note 3. 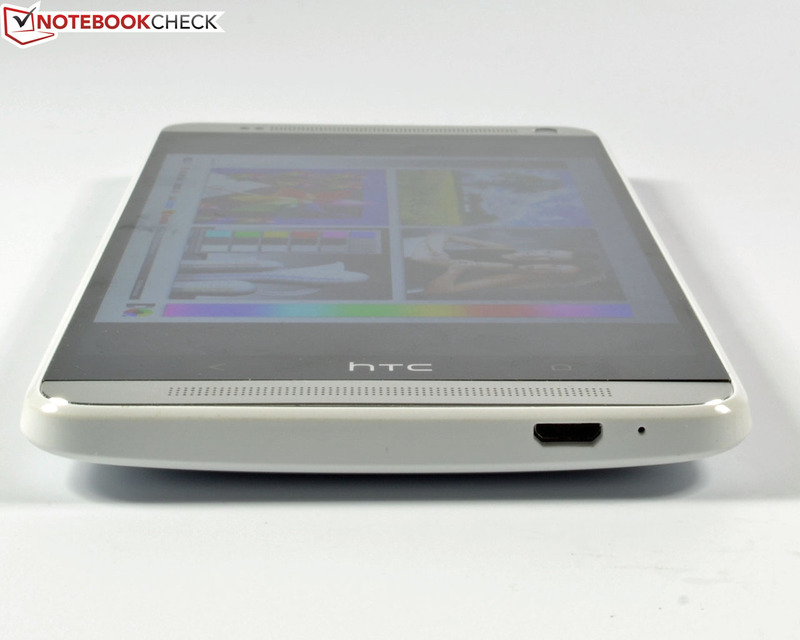 ...a unibody chassis like HTC's One featured. The gigantic phablet, made of elegant aluminum, gleams at us from its box right after its unboxing. 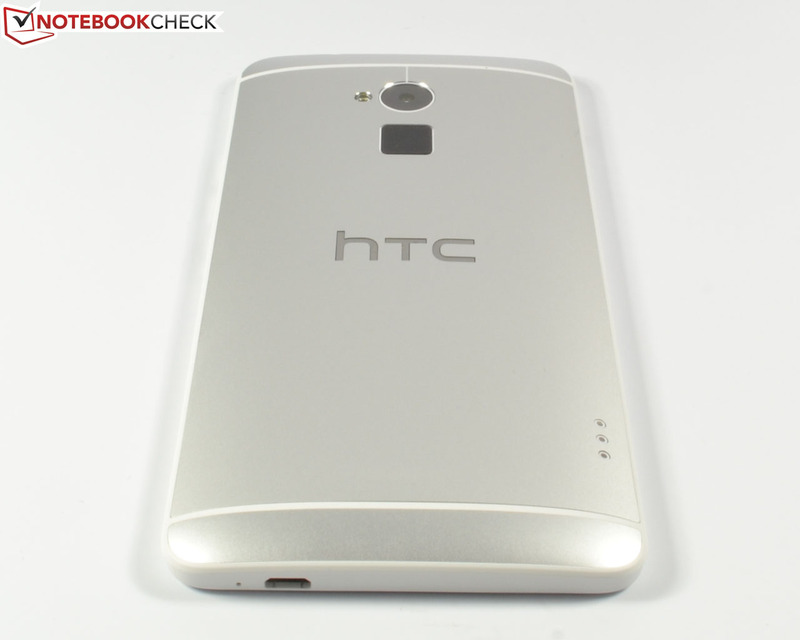 But wait: Like HTC's One Mini, the buyer will not find the aluminum unibody of HTC's One in the One Max. 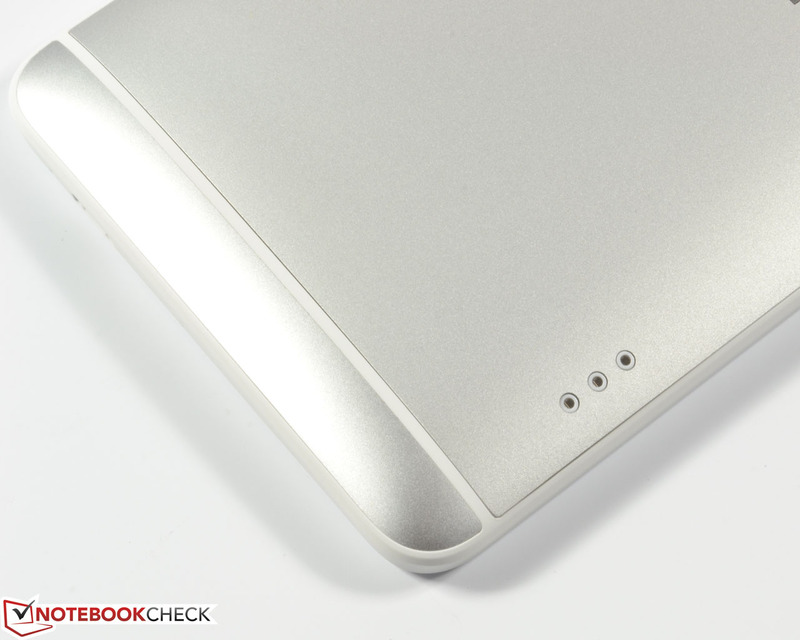 Instead, only the speakers' cover and the rounded back are comprised of this solid material in the review sample. The chassis' frame is made of white polycarbonate that, unlike the One Mini, is matte and makes a somewhat handier impression. 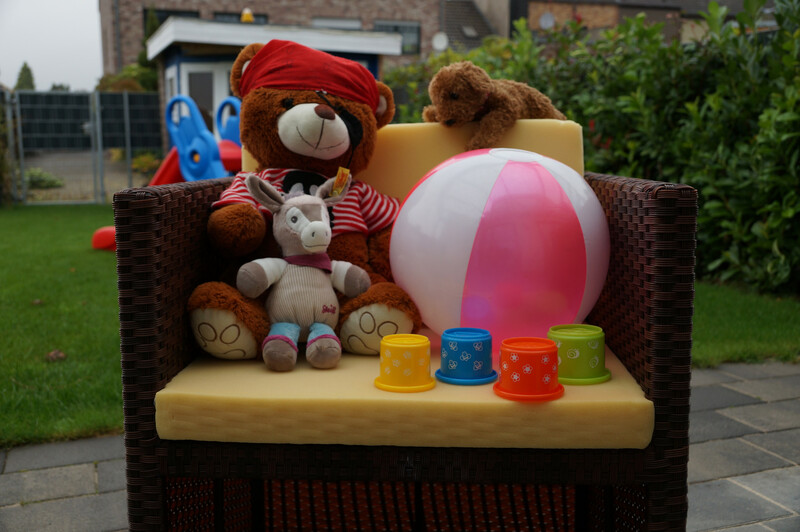 The high build quality of HTC's One is not quite achieved. A few uneven gaps are found between the aluminum and plastic parts. Particularly the lower speaker cover does not fit quite flush in the polycarbonate frame and protrudes marginally. However, the processing is extremely rigid and accurate for a back cover, and the lid barely yields even under stronger pressure. The casing is generally very rigid and robust. Although the plastic frame does not look quite as elegant as the diamond-cut aluminum unibody of HTC's One, the device copes better with smaller drops and is not bruised right away. 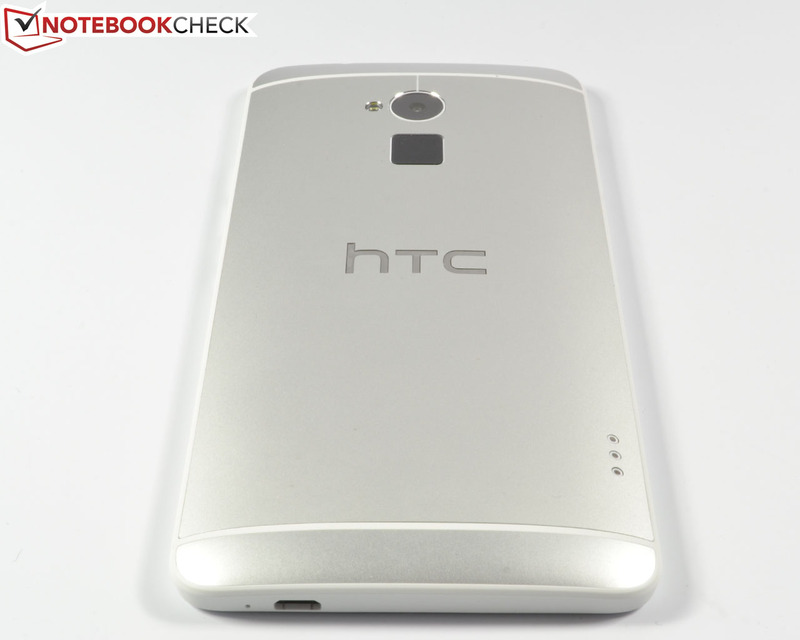 The device is only available in Glacial Silver, so a silvery-white. 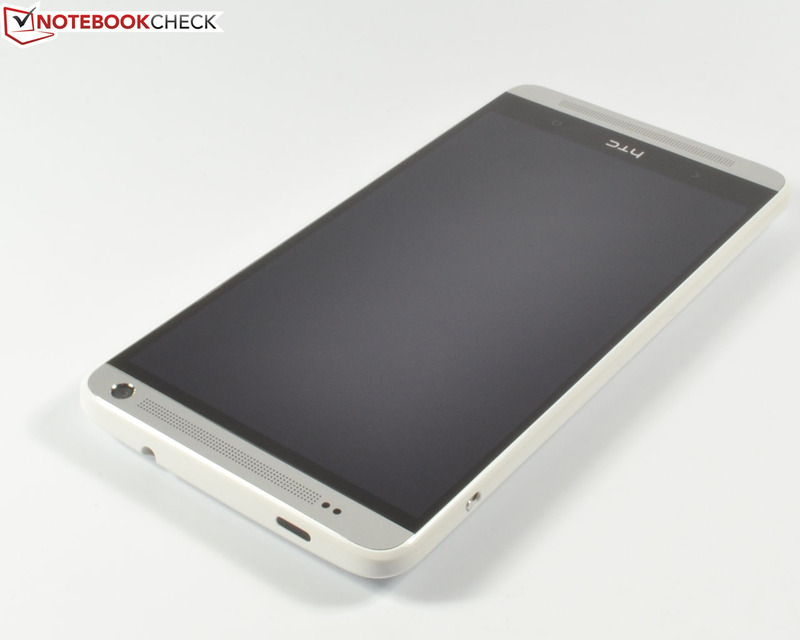 The large, 5.9-inch screen is noticed in the dimensions of 164.5 x 82.5 mm and a thickness of 10.29 mm. Besides that, the phablet also belongs to the heaviest of its kind with a total weight of 220 grams. For comparison: Samsung's Galaxy Note 3 is a whole 52 g lighter, but it also has a marginally smaller screen and a plastic casing. 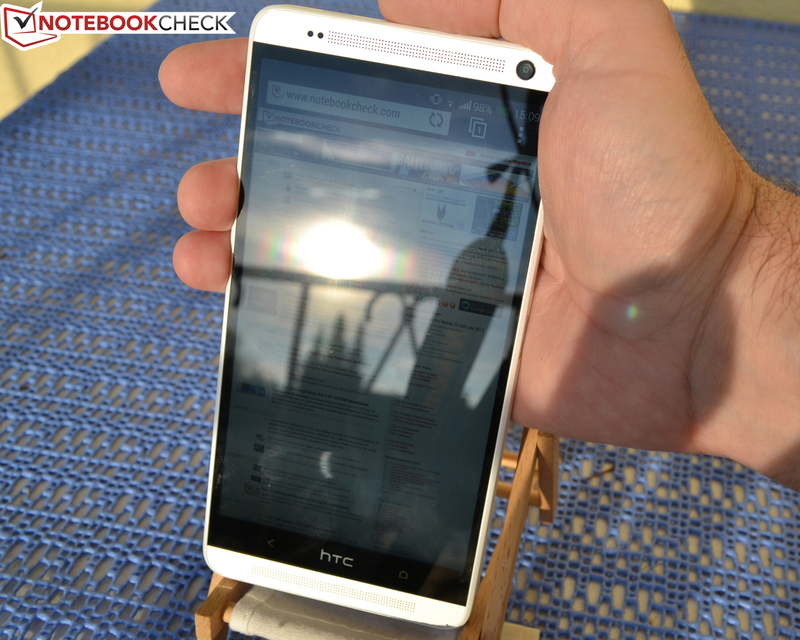 Despite its size, HTC's One Max is pleasant to hold and can be used surprisingly well with one hand. Users with smaller hands will have a slightly harder time though. There is not much news in this category. HTC's One Max features the same ports as HTC's One in form of an MHL-capable micro-USB 2.0 port that also allows connecting a micro-HDMI cord via an adapter, a 3.5 mm audio jack, and an infrared sensor for remote controlling a TV. The volume rocker and power button are again located on the casing's right side. The review sample additionally features a fingerprint scanner and a three-pin "Pogo Pin" port on the back. The latter, for example, connects to docking stations or battery covers via sprung contacts. 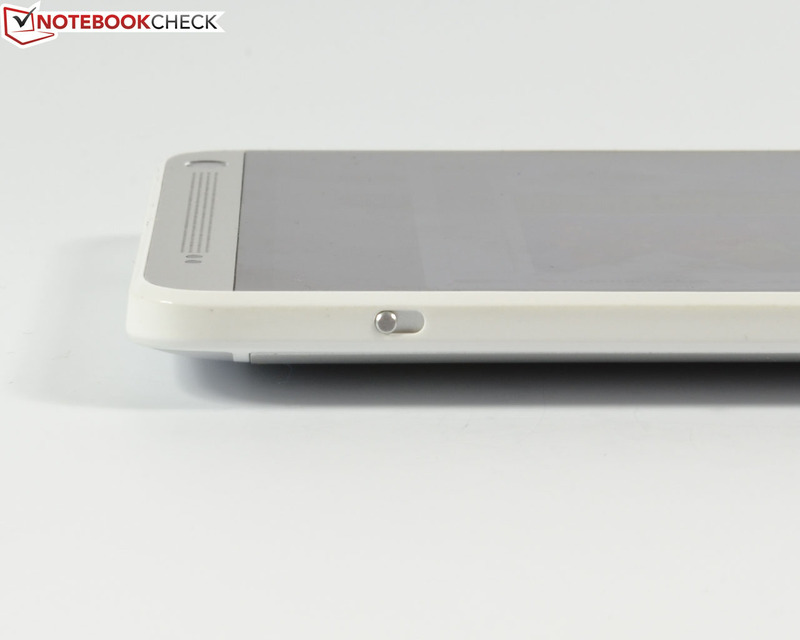 Also new, a slider on the left of HTC's One Max releases the back cover. 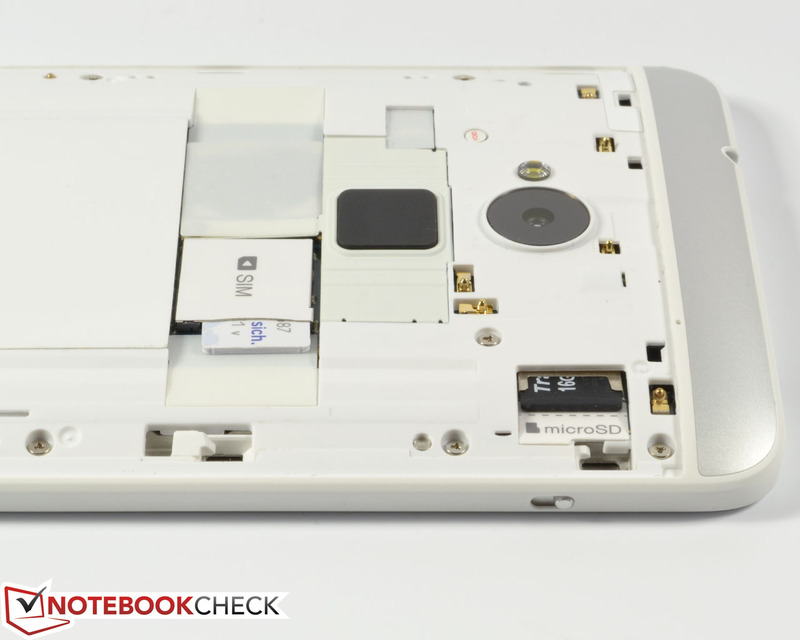 Underneath this, slots for a micro-SIM card and a micro-SD card with up to 64 GB of storage, and the non-removable lithium-polymer battery with a capacity of 3300 mAh are found. The internal storage capacity is 16 GB, but only approximately 11 GB is available. HTC states that there are no models with a higher storage capacity planned. The flash memory can be expanded either via a micro-SD card or a free 25 GB Dropbox storage. Unlike HTC's One and HTC's One Mini, the One Max is delivered with Android 4.3 (Jelly Bean). According to HTC, an update to the new Android 4.4 KitKat is coming in the first quarter of 2014. HTC also installs its new Sense 5.5 interface on the phablet. The user interface looks good and can be used instinctively. The modifications go beyond the Home screen and reach deep into the system settings. Like in the smaller models, the One Max can use HTC BlinkFeed and HTC Zoe. 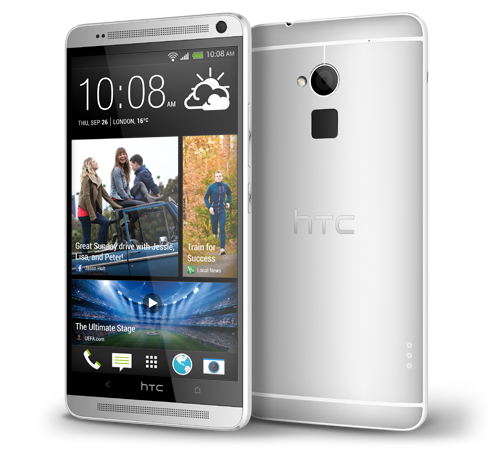 More information about these programs and other proprietary software can be found in the review of HTC's One. 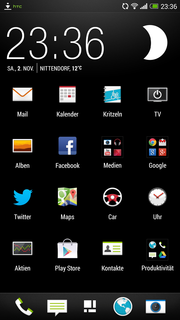 The larger screen enables displaying five apps beside each other; only four were possible on the One. 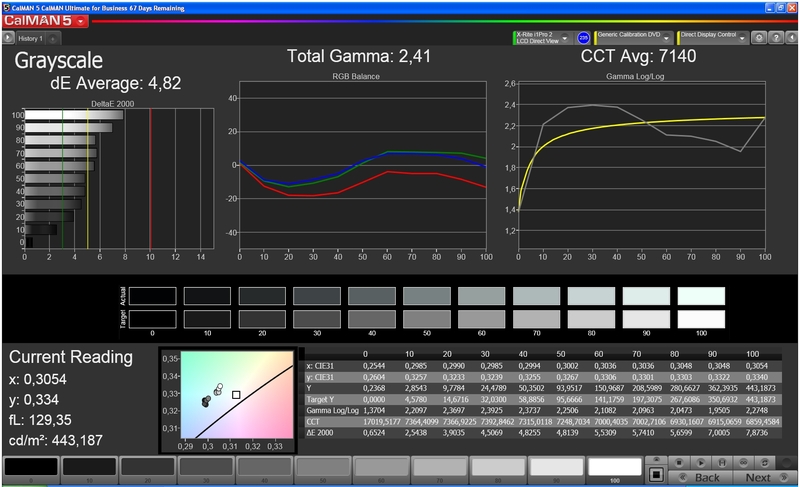 Besides that, a maximum rate can be determined in the automatic screen brightness options. 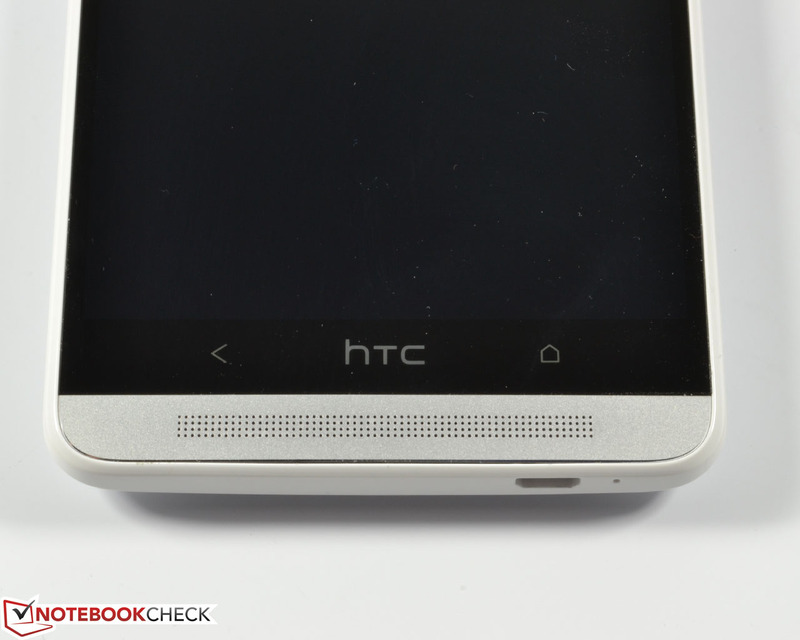 Like HTC's One, the One Max features near-field communication (NFC) and an infrared port. 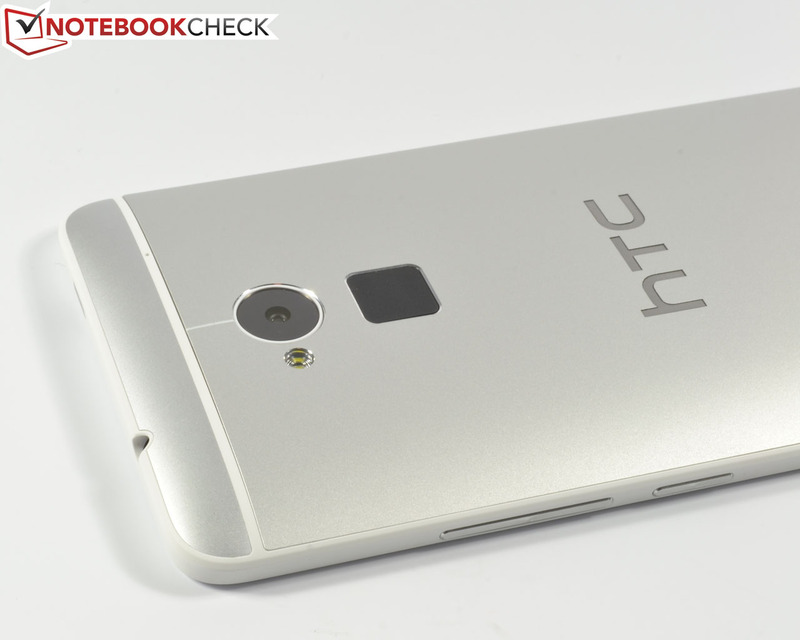 The other communication modules are also the same as in HTC's One flagship. The LTE module transmits in 800/1800/2600 MHz, and HSPA+ (850/900/1900/2100 MHz) is also available. Beyond that, the One Max supports Wi-Fi 802.11 a/ac/b/g/n and Bluetooth 4.0 for local data sharing. The device can also transmit multimedia content via DLNA. 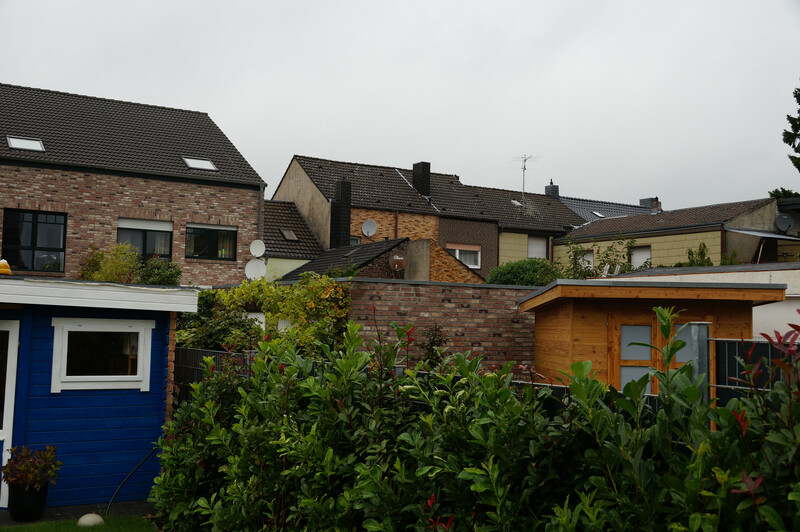 The integrated aGPS module (including GLONASS) locates HTC's One Max quite swiftly even indoors when standing close to a window, and works reliably and accurately. 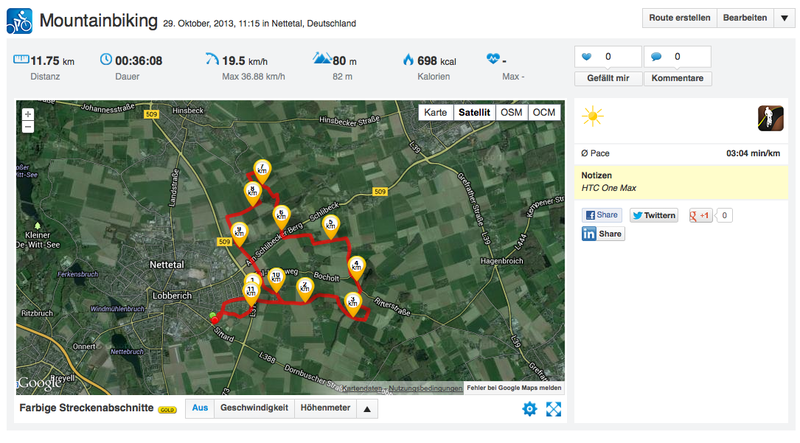 We additionally performed our navigation comparison test using a Garmin Edge 500. 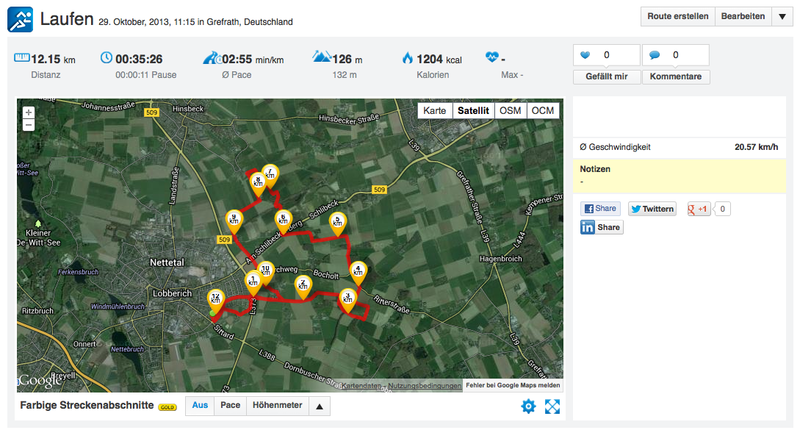 For this, we cycled along a predefined test route, which was partly densely wooded and had many different regional conditions. 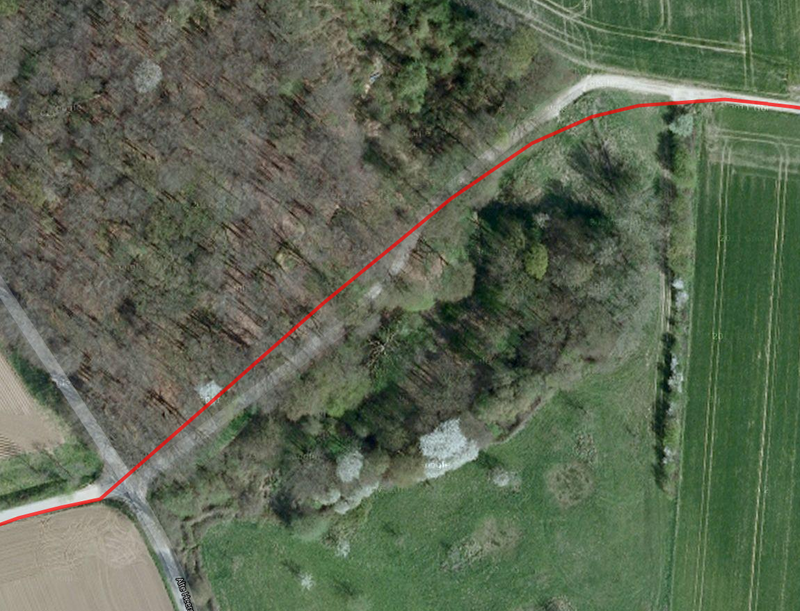 The review sample displayed larger deviations from the actual route in the area of a bridge. 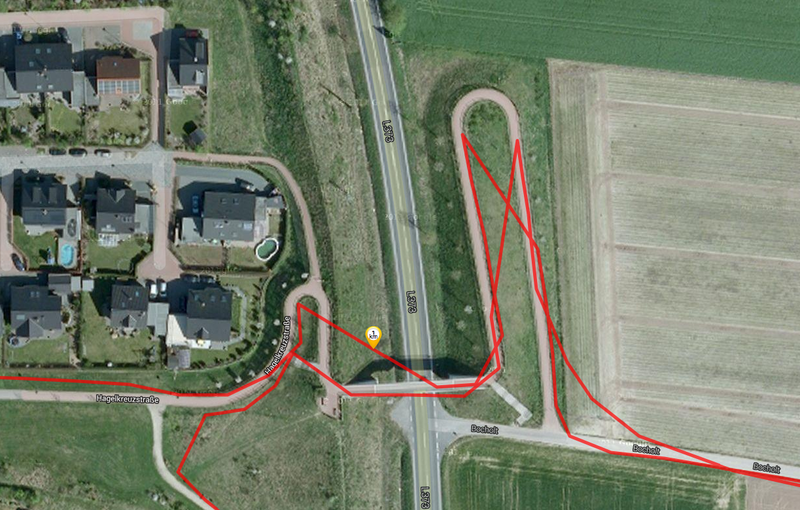 HTC's One Max tended to show zigzag-like shortcuts and frequently presumed that we were off the test route. 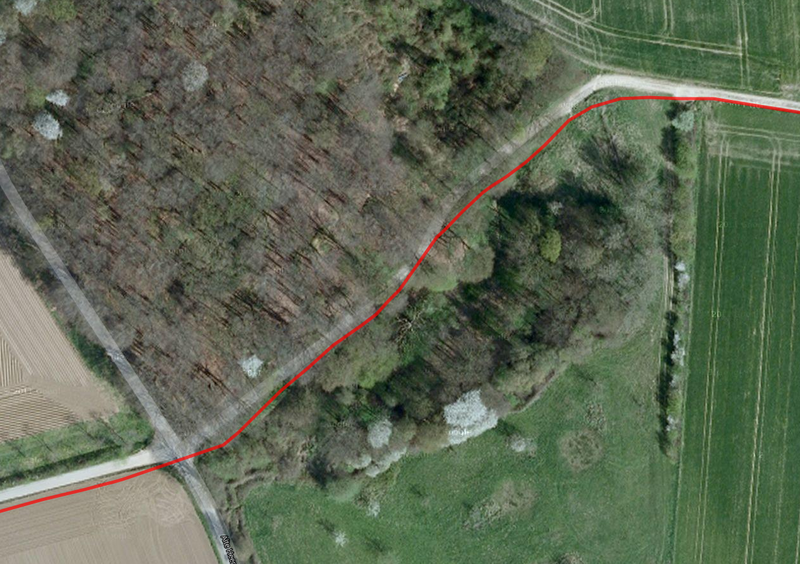 Even the forest trail was only detected inaccurately. The One Max did not display any major tracking deviations on open and straight roads. 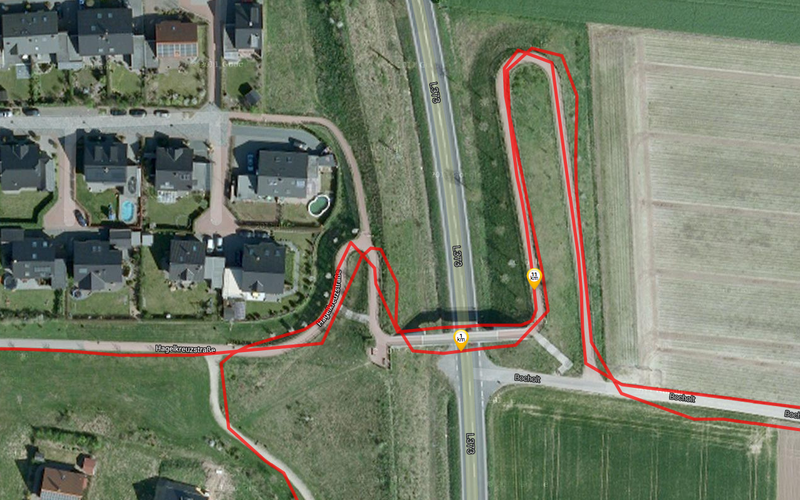 The differences were very clear in the overall distance, where the review sample displayed about one kilometer less than the Garmin navigation system. The One Max is on par with the Samsung Galaxy Note 3 and Sony Xperia Z Ultra contenders, but cannot compete with the category leader Apple iPhone 5s. Nevertheless, the accuracy is overall acceptable. 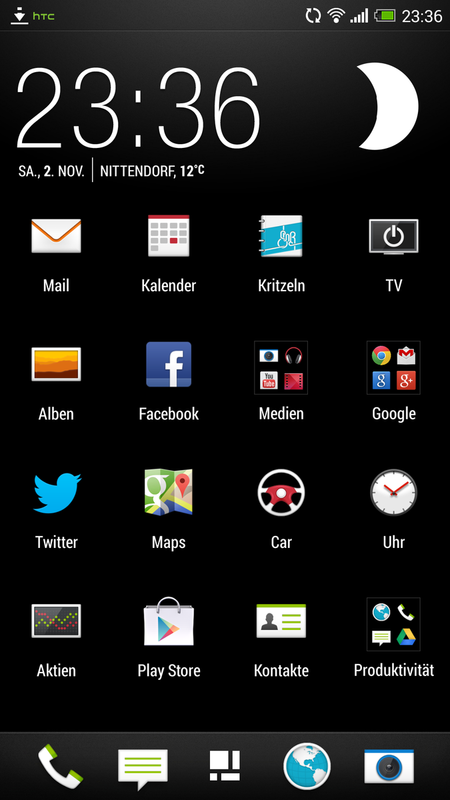 The telephone function under Android 4.3 looks a bit different due to HTC's Sense 5.5 interface, but does not contain any surprises. 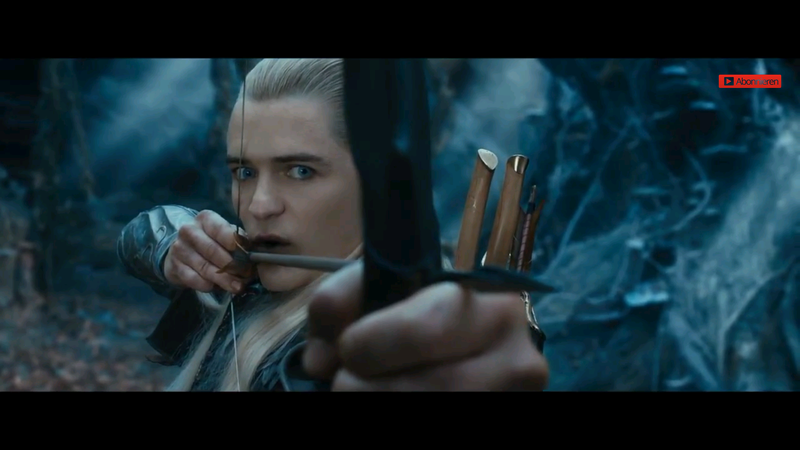 Its use is instinctive. The speech and audio quality during calls is good. Test calls were loud and clear. The front speaker excels in hands-free mode and offers a sufficiently loud and very good reproduction. The included headset is almost just as decent. 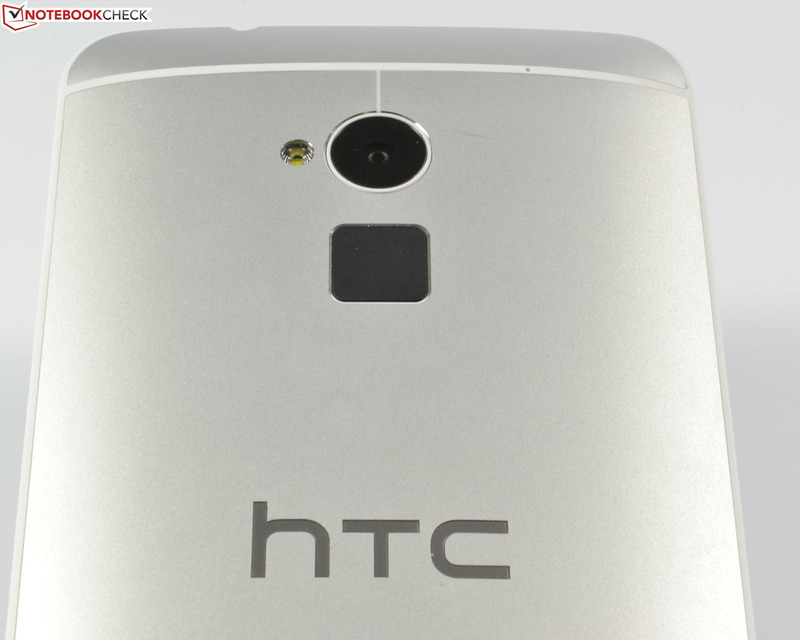 The camera modules from HTC's One and HTC's One Mini have been adopted without modifications. The rear-facing UltraPixel camera still has a resolution of 4 megapixels (2688x1520 pixels) and features a 1/3" BSI sensor, an f/2.0 aperture, and a 28 mm lens. 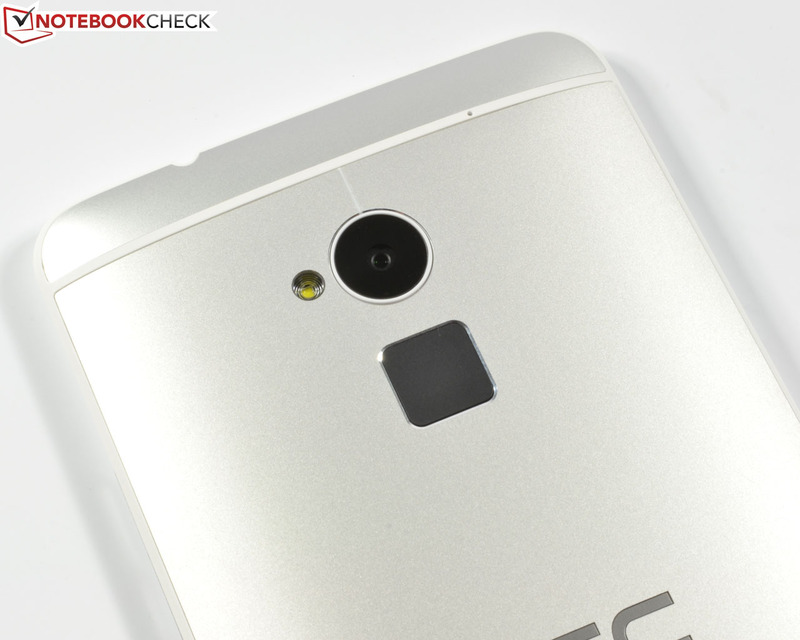 Like HTC's One, the single pixels are considerably larger and allow capturing more light. 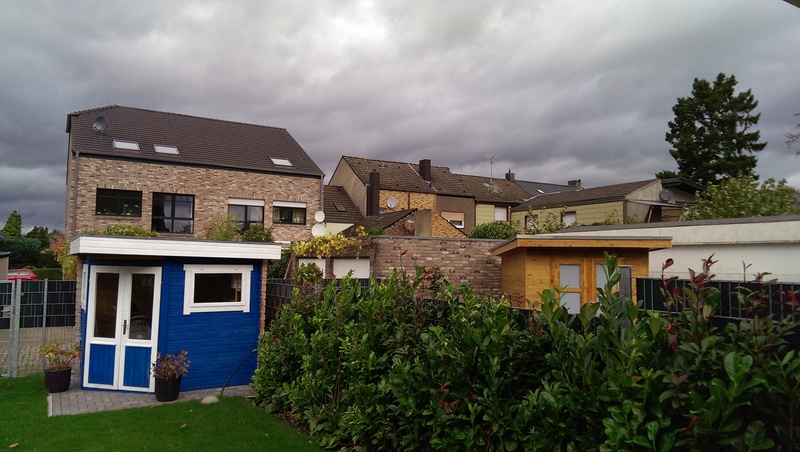 Thus, a lower megapixel resolution can be applied. The five level Smart Flash is again installed, just like the 2.1 megapixel front-facing camera and a wide-angle lens (88 degrees). 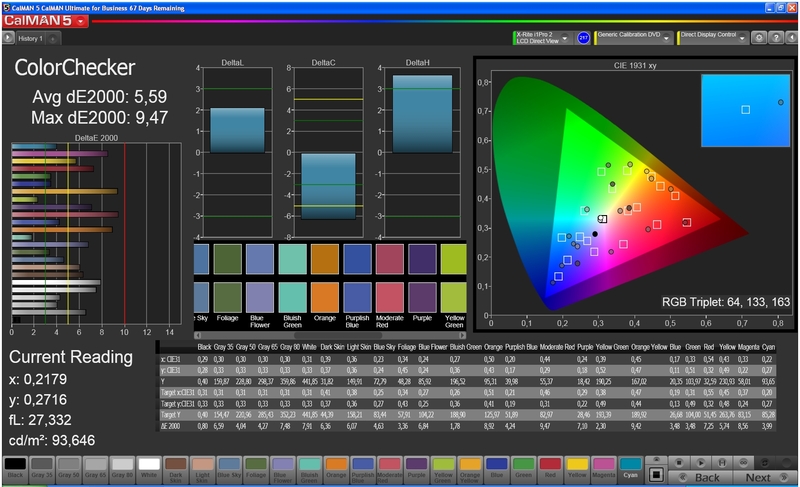 Videos are recorded in 1080p (1920x1080 pixels), and the primary camera features an HDR function. Solely the optical image stabilizer (OIS) has been omitted. 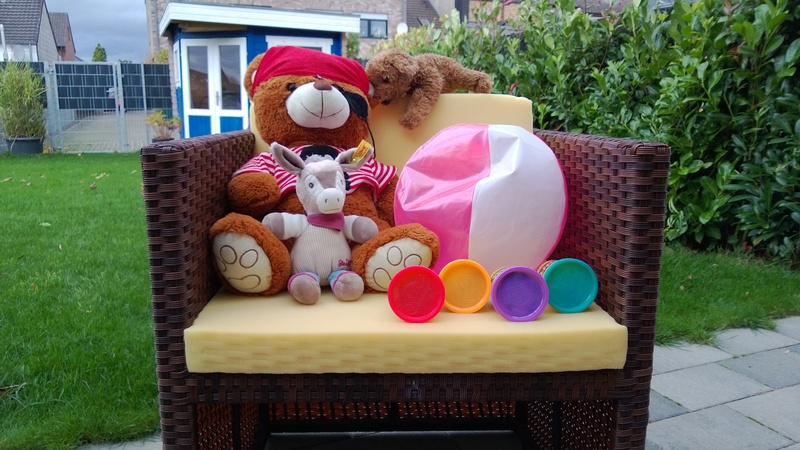 We shot several test pictures for comparison with the contenders. 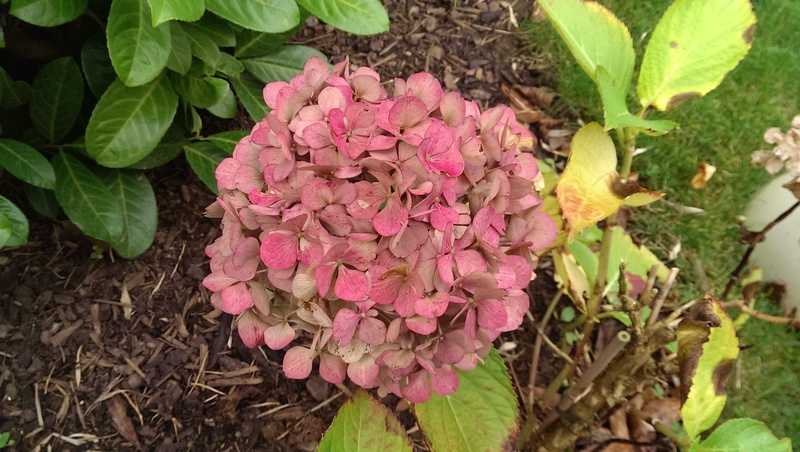 Although the camera sensor has a marginally higher luminosity, it cannot implement that convincingly in photos. 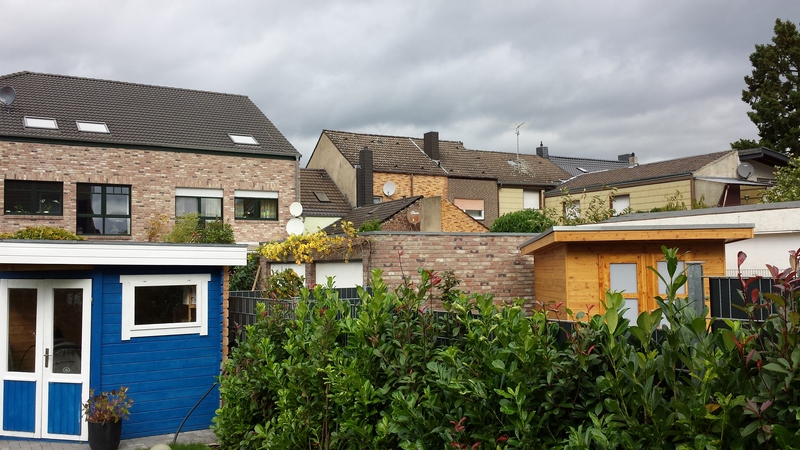 Compared with the competition, the pictures look a bit darker, and lack both focus and color fidelity. The photos generally seem to struggle with a light color cast. The low maximum resolution sometimes results in blurry details, which is particularly evident when zooming in on image sections. Immediate contenders, such as Samsung's Galaxy Note 3, are clearly in the lead here. HTC's phablet comes with a modular power supply alongside a 1 m long USB cord, as well as the in-ear headset known from HTC. In addition to styli, the BoomBass sound cube and various other accessories, a Power Flip Case is also optionally available. Besides its protective and stand functionality, the telephone cover also includes a 1150 mAh battery. It is connected to the phablet via the Pogo pin, and is automatically recharged via the device's micro-sub interface. HTC's One Max includes a 24 month warranty. The battery and accessories are only covered for 12 months. 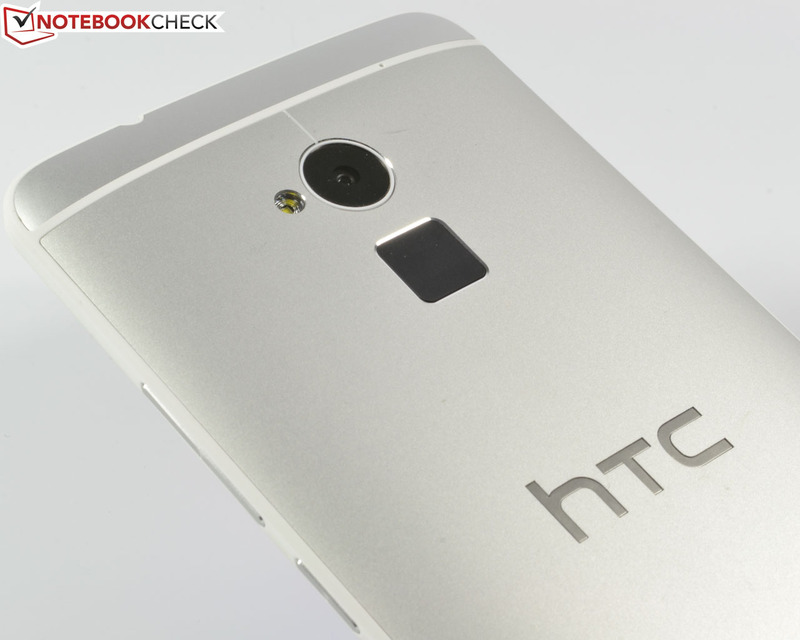 The fingerprint scanner is the only new feature compared with the input devices known from HTC's One and One Mini. It is located on the device's back, directly below the camera and supports up to three different fingerprints. Unlike the iPhone 5s, it cannot be used for shopping in the PlayStore. However, a total of three default applications or other installed apps can be mapped with three different fingers. For example, the right index finger can be used for unlocking the screen, another finger starts the camera and a third finger opens the internet browser. The finger is not placed on the sensor, but has to be swiped over it for identification. 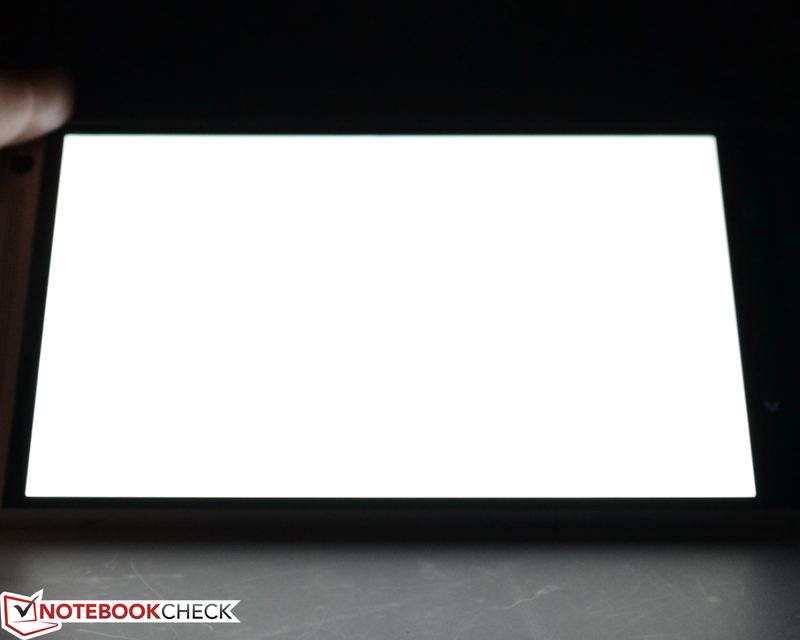 However, the phablet first has to be reactivated from standby before the sensor can be used. The sensor's positioning and a slight cavity on the back cover make its use instinctive and easy. The camera is sometimes unintentionally fingerprinted because the sensor is located directly below it. The central input device, i.e. the capacitive 5.9-inch screen, detects all inputs precisely and implements them swiftly. The screen's 90° rotation is also fast. Multi-touch gestures make even more sense on a bigger screen and they function flawlessly. 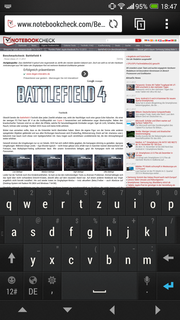 The screen's large diagonal also facilitates typing on the virtual QWERTY keyboard, which reserves less than half the screen in portrait mode. 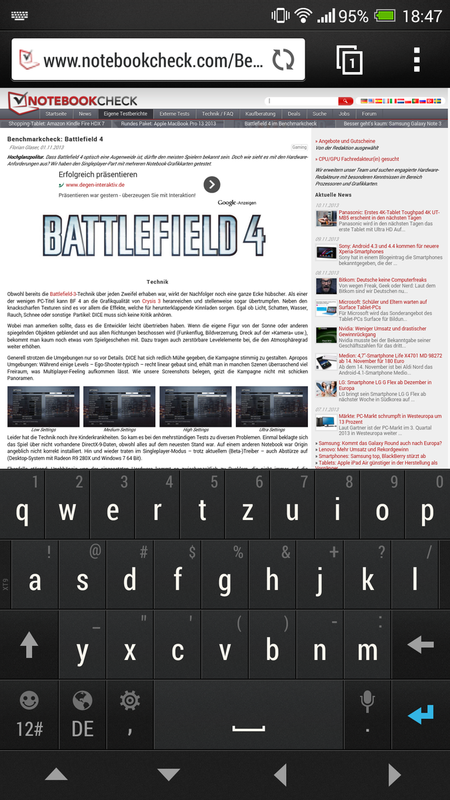 The keys take up about 50% of the screen in landscape mode, which still provides enough view of the website above it. Now we come to the actual highlight: HTC's One Max dishes up a gigantic-looking 5.9-inch, SuperLCD 3, IPS, LED screen with a Full HD resolution (1920x1080 pixels). Its pixel density is thus 373 ppi. Samsung's Galaxy Note 3 is a bit smaller with 5.7-inches, but compared with giants like Sony's Xperia Z Ultra featuring a size of 6.44-inches, the One Max looks almost small. Using the X-Rite i1Pro 2, we measured the screen's other rates. The review sample's average brightness is 449.8 cd/m². 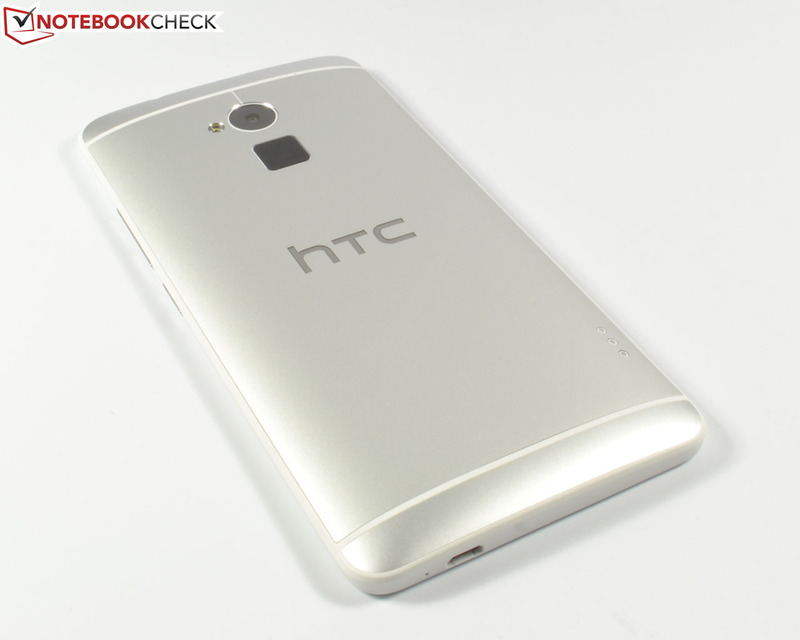 HTC's One managed a whole 488.9 cd/m² and HTC's One Mini still achieved 466.1 cd/m². 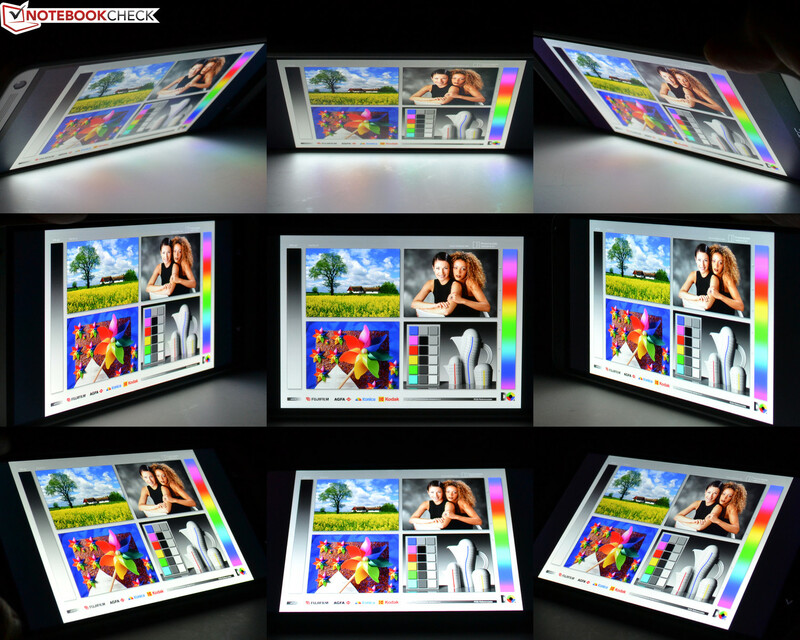 However, the LCD screen scores with a very homogeneous illumination of 95%. Compared with the competition, the One Max has a very good placing. Samsung's Galaxy Note 3 only manages 342.2 cd/m² with an illumination of 81% due to its AMOLED screen; both Sony's Xperia Z Ultra with 441.9 cd/m²/81% and Samsung's Galaxy Mega with 443.7 cd/m²/90% are close behind our review sample. Solely Huawei's Ascend Mate just surpasses the One Max with 470.7 cd/m², but also only offers an illumination of 89%. With a very decent black value of 0.43 cd/m² and a great contrast of 1035:1, HTC's One only has to bow to Samsung's Galaxy Note 3 and its AMOLED screen for technology-related reasons. Only Samsung's Galaxy Mega is on par. 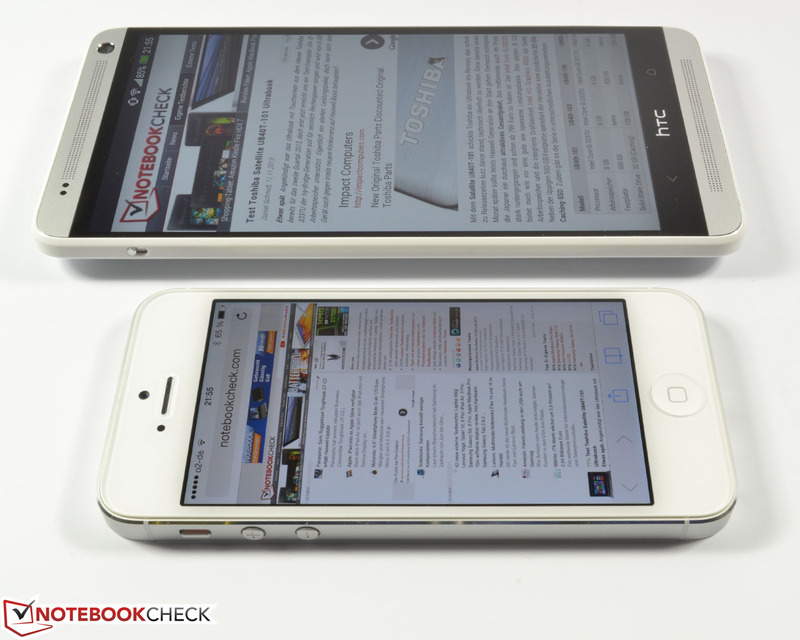 However, HTC's One Max cannot compete with the LCD's top rates in HTC's One. 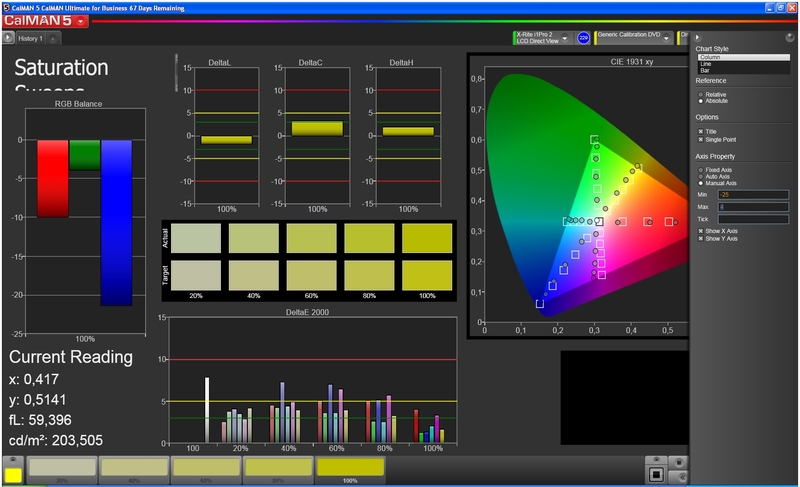 We checked color accuracy, grayscale reproduction and color saturation using CalMAN software. Unlike HTC's One or One Mini, the One Max no longer exhibits such an intense blue shift. However, red is a bit weaker. 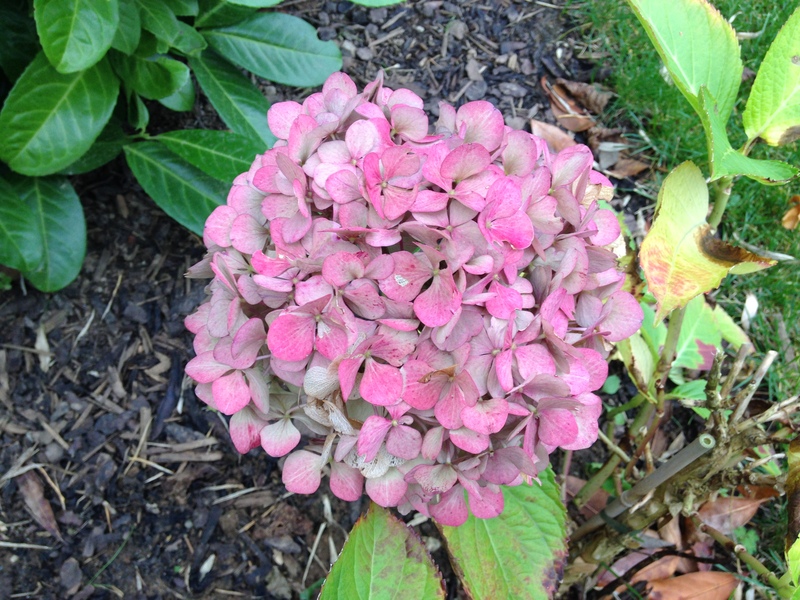 The color saturation nevertheless shows an evident blue deficit. The grayscale gradient first clearly deviates from the ideal at approximately 70%, which lets white look a bit too pale. 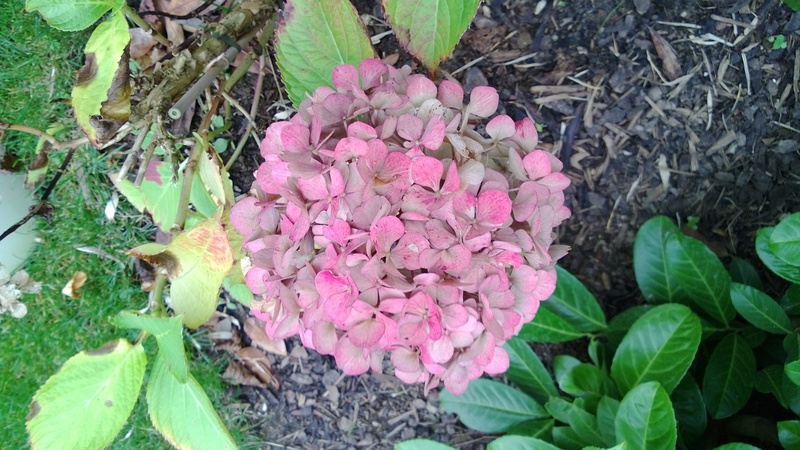 However, this is not visible in routine use, as the untainted white image proves. The reproduction and sharpness subjectively make a very good impression. HTC's One Max is impressive in outdoor use owing to its high contrast and bright screen. However, the screen's automatic brightness control should be disabled in unfavorable light in order to achieve maximum brightness. The One Max cannot defy direct sunlight very well due to its reflective screen surface. A third-party, matte screen protector could help here. The One Max scores in this category due to the underlying IPS technology. The screen exhibits high stability even from extreme viewing angles; the brightness first decreases marginally at a very late point. 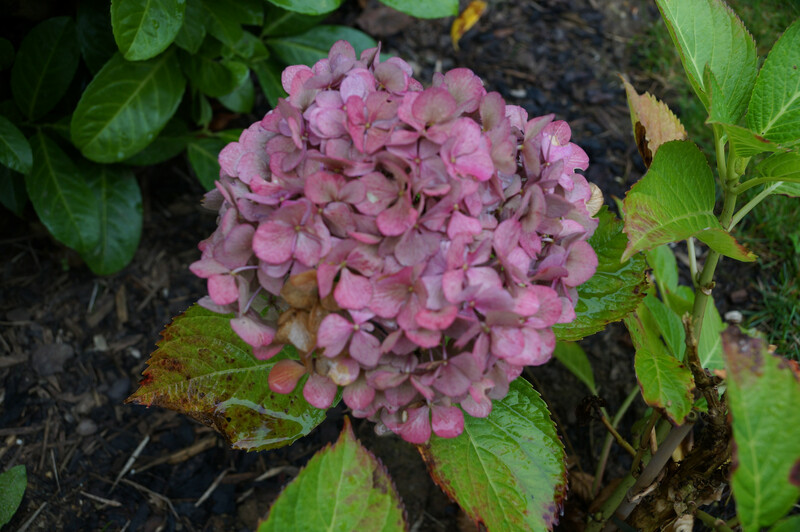 However, the color reproduction is always good. Like in HTC's One, our review sample is powered by a Qualcomm Snapdragon 600 quad-core SoC with a clock rate of 1.7 GHz and integrated Adreno 320 graphics card. 2 GB of LPDDR2 RAM are also installed although the SoC could cope with a faster LPDDR3 RAM. 16 GB of internal storage is available. Some contenders have more to offer here. Samsung's Galaxy Note 3 and Sony's Xperia Z Ultra boast with Qualcomm's Snapdragon 800 quad-core SoC with a clock rate of 2.3 GHz; the Samsung even sports a whole 3 GB of LPDDR3 memory. 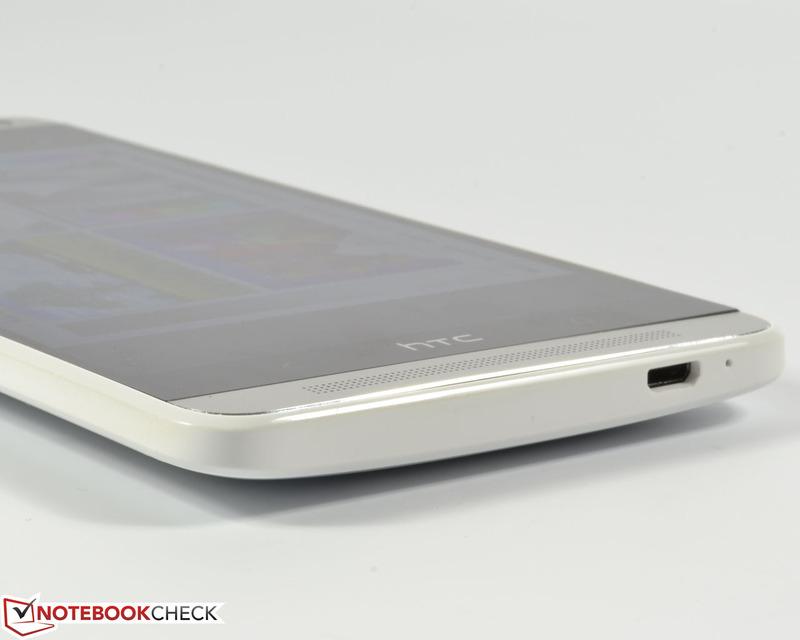 Nevertheless, the quad-core in HTC's One Max provides more than enough power. 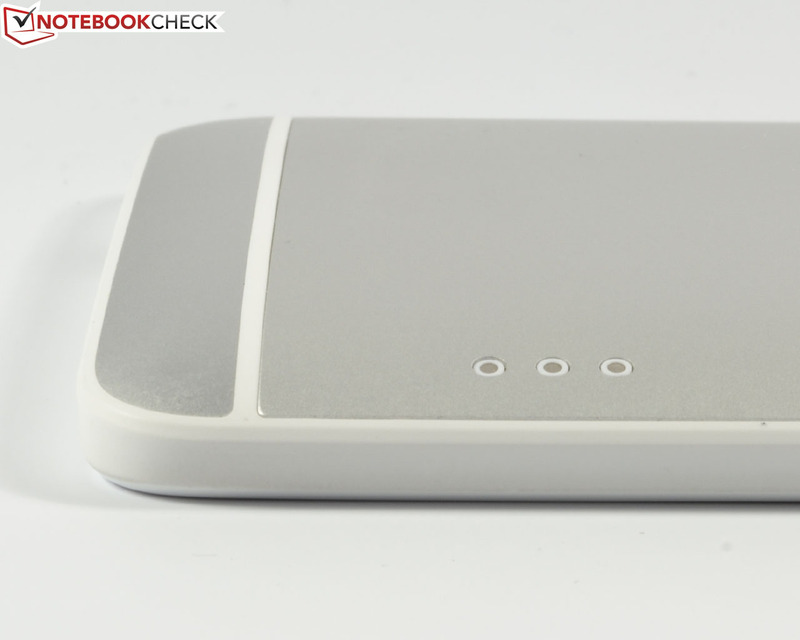 Besides, a wireless module with Bluetooth 4.0 and Wi-Fi 802.11 a/ac/b/g/n found their way into the slim casing. 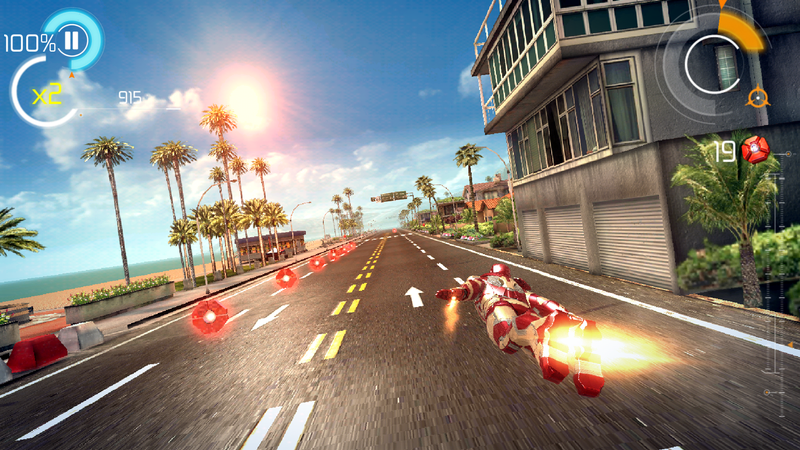 HTC's One Max has to show its qualities in our extensive benchmark course. The cutting-edge chip faces the competition in AnTuTu Benchmark v4. With 26447 points, HTC's One Max achieves 20 to 24% less than Samsung's Galaxy Note 3 and Sony's Xperia Z Ultra. This superiority continues through all benchmarks. 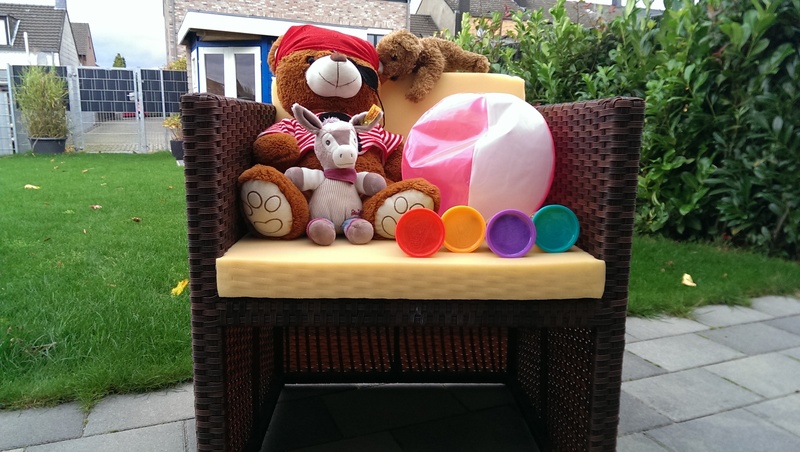 Our review sample can only surpass Samsung's Galaxy Mega in GFXBench 2.7; the other contenders outpace it. 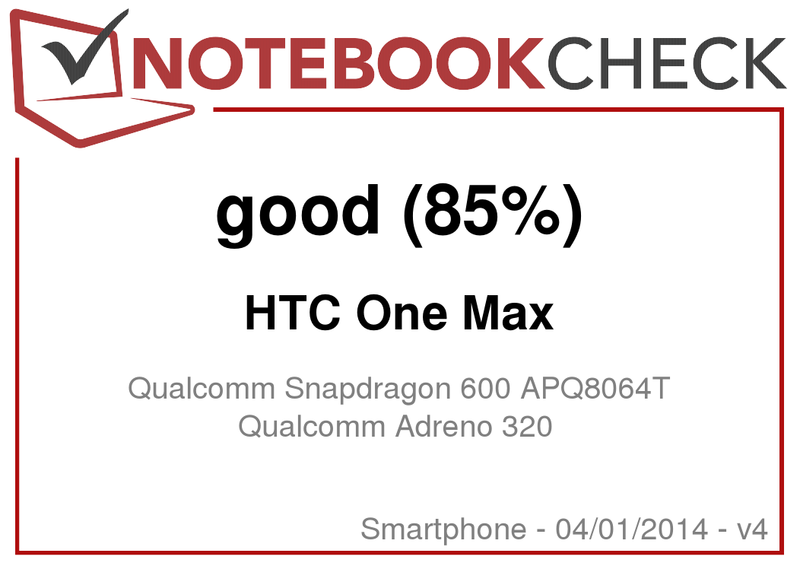 However, the One Max scores with an up to 84% better result than its competition in the Smartbench 2012 and Linpack for Android tests - with exception of both above named powerhouses. The AndroBench 3 benchmark analyzes the write and read speeds of the internal storage. 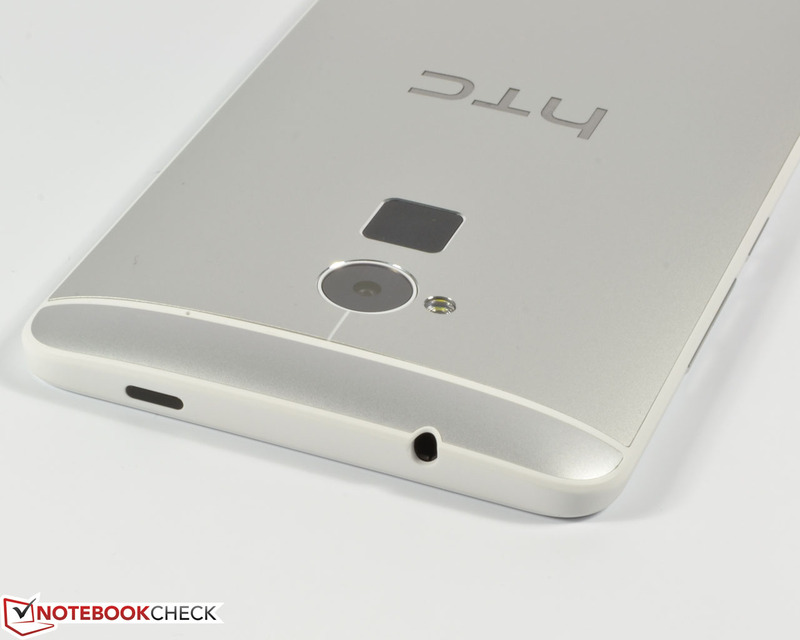 HTC's One Max still has reserves here. With 57 MB/s in sequential read, the review sample beats Samsung's Galaxy Mega and Huawei's Ascend Mate and is almost on par with HTC's One and Sony's Xperia Z Ultra, but it cannot keep up with the swift Samsung Galaxy Note 3. The same power ratio is seen in sequential read of 256 KB blocks with a speed of 11.14 MB/s. It looks similar in writing 4 KB blocks, although contenders like Samsung's Galaxy Note 3 are partly three times as fast. These speed differences are barely noticed in routine use. Subjectively, HTC's One Max works very fast here. Our review sample completed the browser-based tests, performed with the device's browser, very nicely. It achieved 2479 points in Browsermark 2.0 and leaves HTC's One behind. Samsung's Galaxy Note 3 and Sony's Xperia Z Ultra achieve about 20% more. Both contenders clearly perform better in Google's Google V8 Ver. 7 and Octane V1 benchmarks. The review sample missed Samsung's Galaxy Note 3 by one little percentage point, and Sony's Xperia Z Ultra "only" achieves 14% more in the Peacekeeper benchmark. 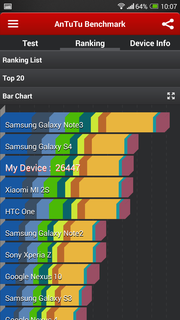 The One Max even finished both Sunspider tests 25 to 28% faster than Samsung's Galaxy Note 3. Sony's Xperia Z Ultra wins by a hair with 6 and 2%. 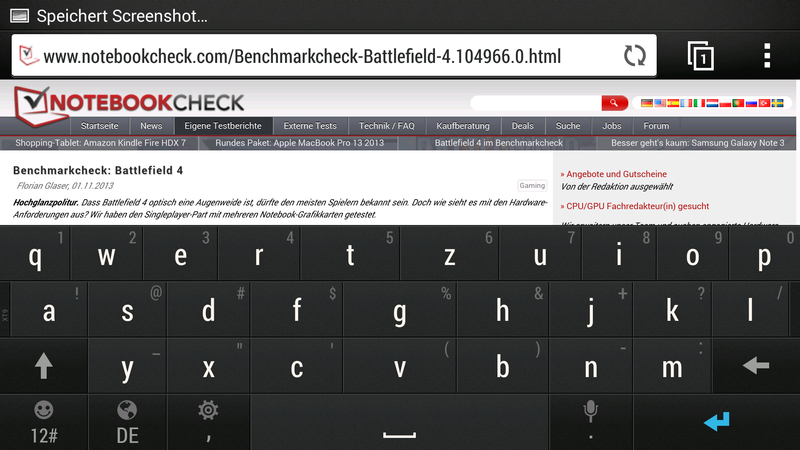 HTC's One Max can partly keep the other contenders at a clear distance in all browser benchmarks. As always, much better results can sometimes be achieved with alternatives like Google Chrome. 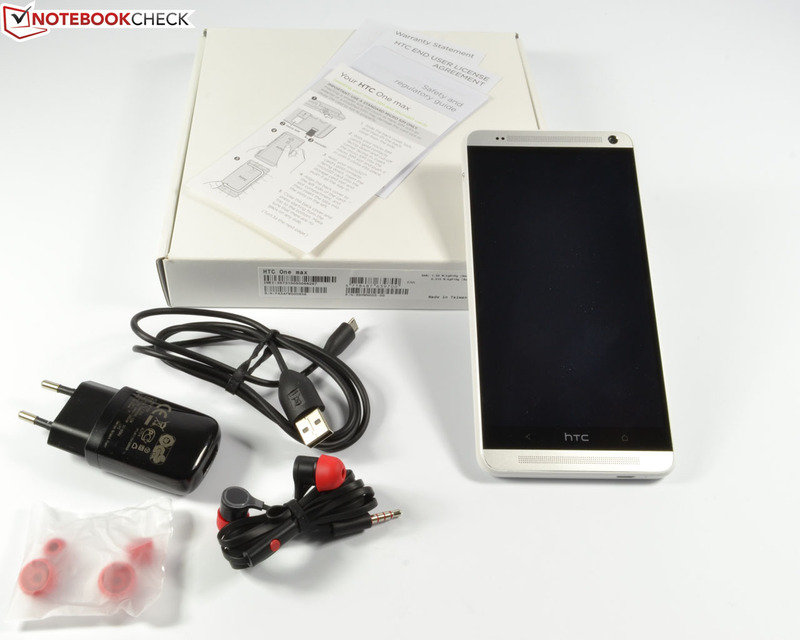 HTC's One Max scores in this category with its big screen and powerful components. Full HD trailer videos are no problem for the SoC and look fantastic on the Full HD screen, perfectly accentuated by the good stereo speakers. The SoC cannot decode Ultra HD videos. This is reserved for stronger contenders, such as Sony's Xperia Z Ultra or Samsung's Galaxy Note 3. Currently there is no game in the PlayStore that would be too much for the hardware. 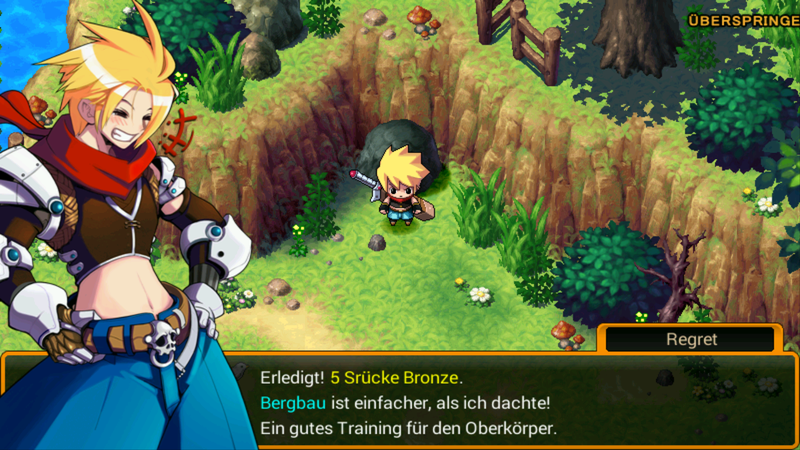 The preinstalled role-playing game Zenonia 4 runs just as smoothly as the action hit Iron Man 3. 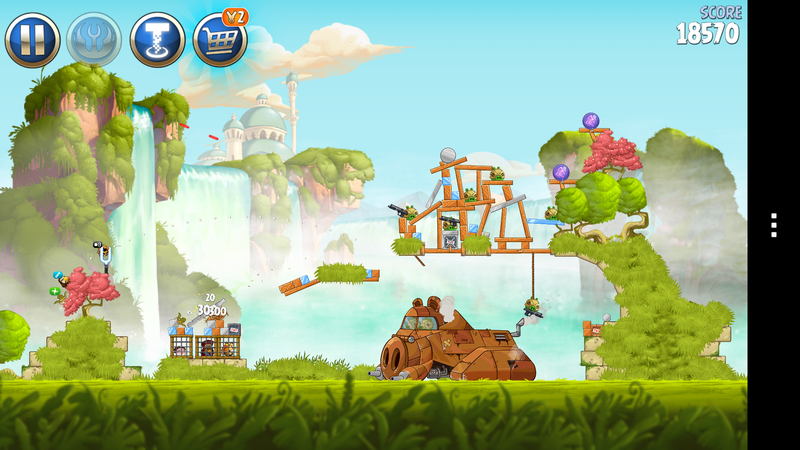 Of course, 2D games like Angry Birds Star Wars bare no exception. Control via touchscreen, and position and accelerometer always worked accurately and lag-free. The graphically sophisticated benchmark Epic Citadel verifies the high gaming power. Both stronger Sony Xperia Z Ultra and Samsung Galaxy Note 3 can first take the lead in the ultra-high quality setting. 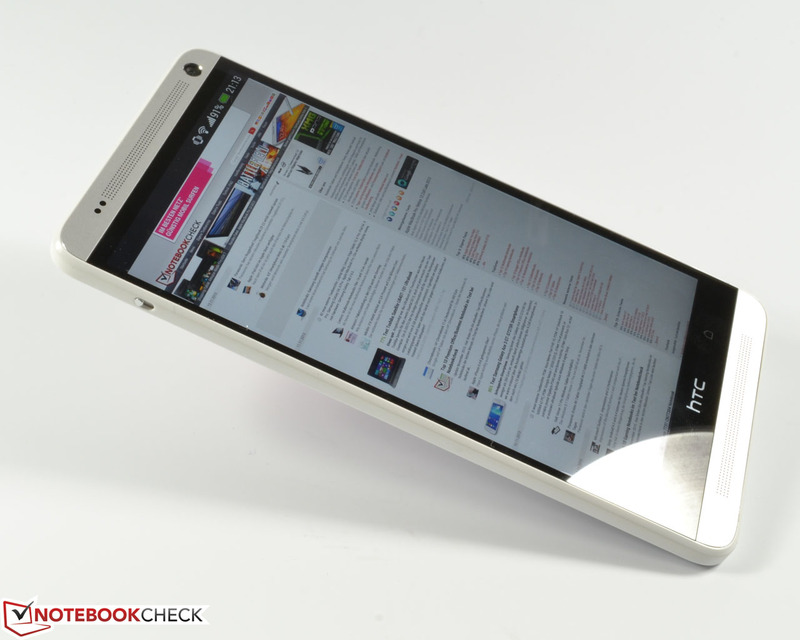 HTC's One Max otherwise keeps its contenders at bay. Everything we said in the review of HTC's One applies here, although the collaboration with Beats Audio has been discontinued. The speakers produce the best sound currently found in a phablet. Bass naturally benefits when the device is placed on a table during playback. Overall, a balanced, rich sound that conveys real stereo to the user. The bigger casing has a positive effect in this category. HTC's One Max barely heats up when idling and remains 2 °C below the cool HTC One with a maximum of 32 °C. The phablet even remains significantly cooler than its smaller sister model during permanent full load, ascertained in the stress test via the Stability Test app over several hours. A maximum of 35.5 °C was reached selectively on the front; the aluminum back stayed below that with at most 34 °C. We measured an average of 33.4 and 32.4 °C, which are truly low temperatures in view of the high-performance components. (±) The average temperature for the upper side under maximal load is 33.4 °C / 92 F, compared to the average of 33.1 °C / 92 F for the devices in the class Smartphone. (+) The maximum temperature on the upper side is 35.5 °C / 96 F, compared to the average of 35.6 °C / 96 F, ranging from 22.4 to 51.7 °C for the class Smartphone. 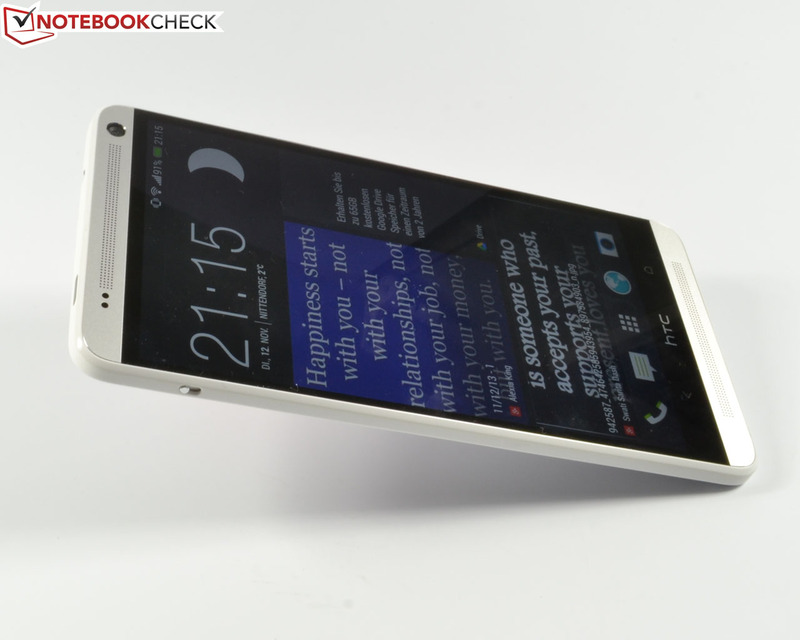 Owing to an optional energy-saving mode, the power consumption of HTC's One Max is pleasantly restrained. It is within a good range in the category comparison with idle rates between 0.5 and 1.9 watts. Samsung's Galaxy Note 3 consumes a bit less with 0.4 to 1.4 watts and Sony's Xperia Z Ultra requires considerably more with 0.8 to 2.5 watts. The review sample's consumption ranged from 3.0 to 5.3 watts during full load. Contenders like Samsung's Galaxy Note 3 with an equally sized screen or Sony's Xperia Z Ultra with a 0.54-inch bigger display drain considerably more from the outlet with 6.5 and 6.1 watts respectively. To be fair, we have to note that both also sport a stronger SoC. The non-removable battery has a capacity of 3300 mAh (12.54 Wh) and is a bit stronger than that of Samsung's Galaxy Note 3 and Samsung's Galaxy Mega (both with 3200 mAh/12.16 Wh), or Sony's Xperia Z Ultra (3000 mAh/11.6 Wh). 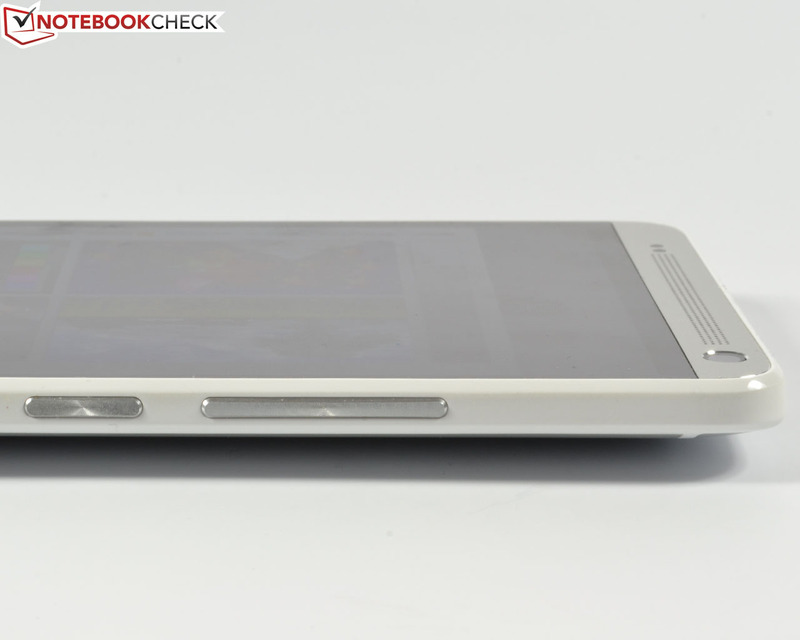 However, HTC's One Max cannot compete with the 4050 mAh battery in Huawei's Ascend Mate. Owing to the review sample's moderate power consumption, it can place itself at almost the top of the phablet category with a good idle runtime of 25 hours and 43 minutes. 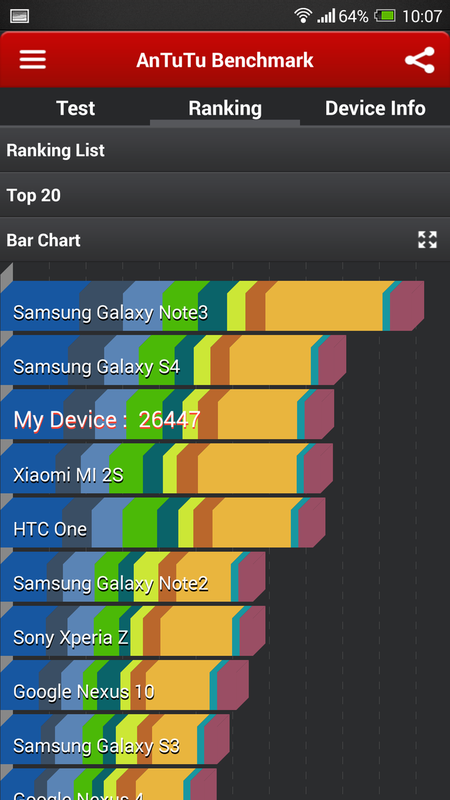 Only Samsung's Galaxy Note 3 runs away with an awesome 36.5 hours. HTC's One Max lasted for approximately 14 hours in the Wi-Fi test, ascertained with the screen's brightness set to half and a script that alternately opens various websites. Here again, only Samsung's Galaxy Note 3 lasts longer. The review sample reached a still good 5 hours during load and maximum brightness and thus two HD movies on the go should not be a problem. 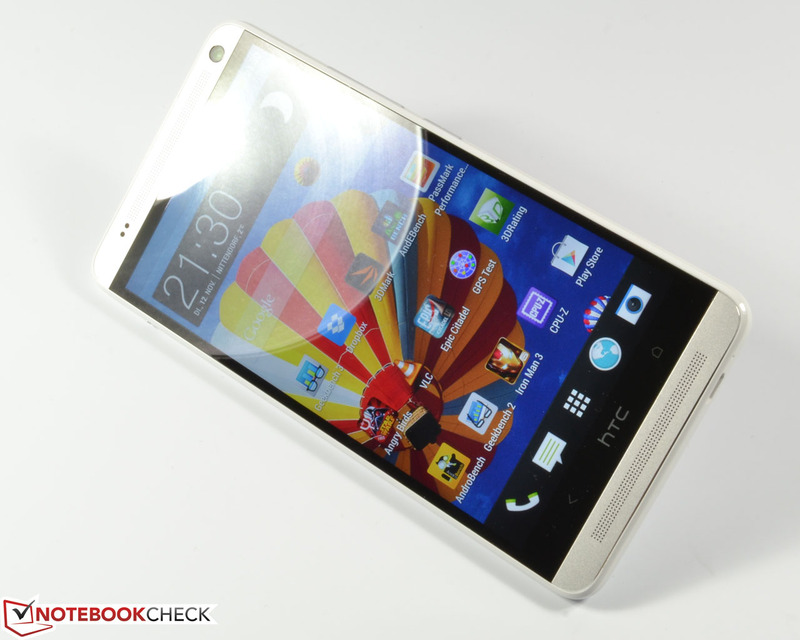 No contender could beat HTC's One Max in this test. We can only answer the question asked at the beginning of this review, whether the concept of HTC's One Max can succeed, with a clear "Yes". HTC's slogan "...more everything" is true. Except for the omitted image stabilizer, HTC's One Max is a blown up version of the great HTC One, but with a micro-SD slot and decently implemented fingerprint scanner. The big 5.9-inch, bright IPS touchscreen is compelling and reproduces content with high contrasts and crisp colors. Browsing, watching movies and games on the go are really fun with it. The well-sounding stereo speakers on the front decisively add to that. All the cutting-edge wireless technologies and the 16 GB flash memory round off the good configuration. 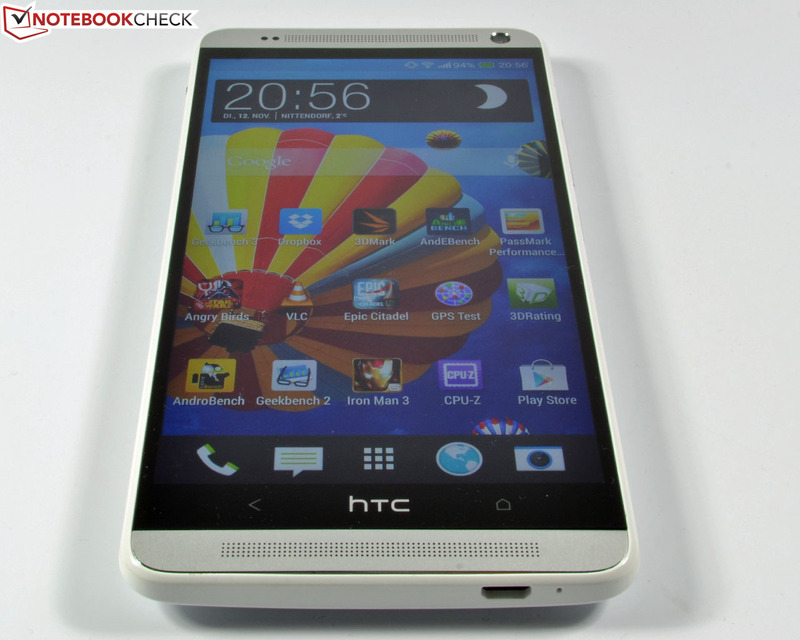 The software excels with its instinctive user interface, HTC Sense 5.5 and a few useful, preinstalled apps. 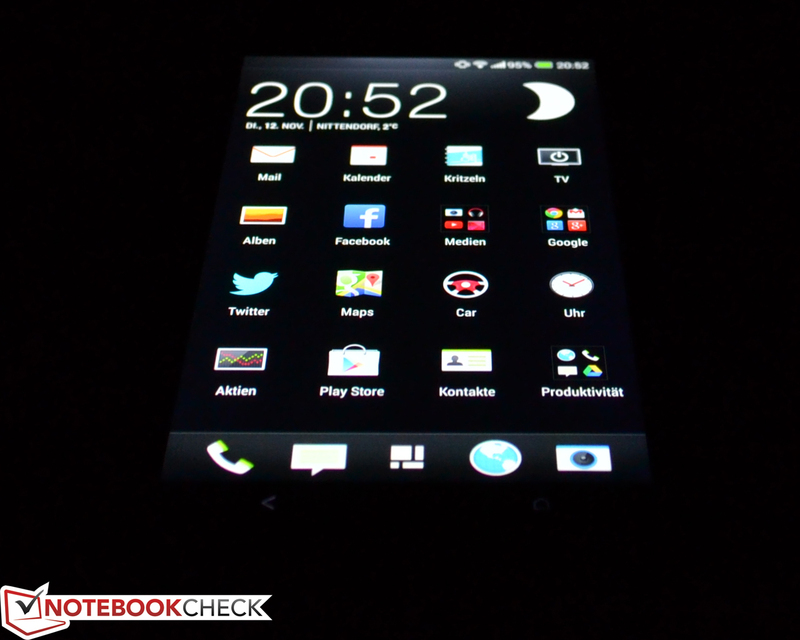 Additionally, the phablet scores with long battery runtimes and a good application performance. The quad-core SoC with a clock rate of 1.7 GHz and 2 GB of working memory will provide enough power even for the future. 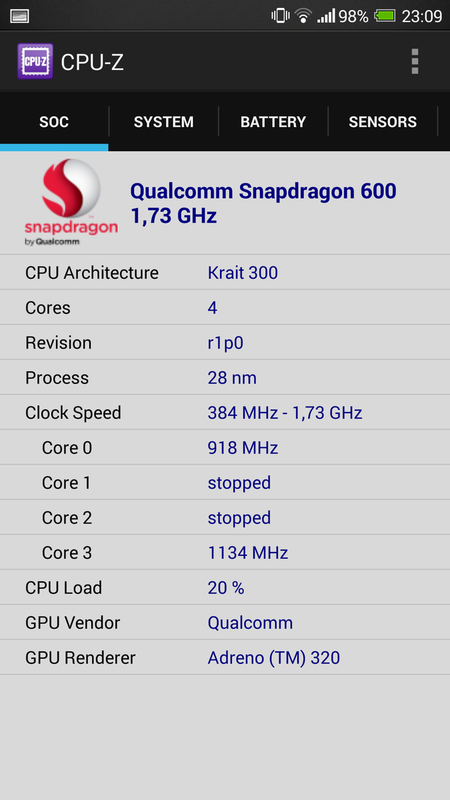 However, we would have hoped for the stronger Snapdragon 800 MSM8974 and a faster LPDDR3 RAM in the new flagship. 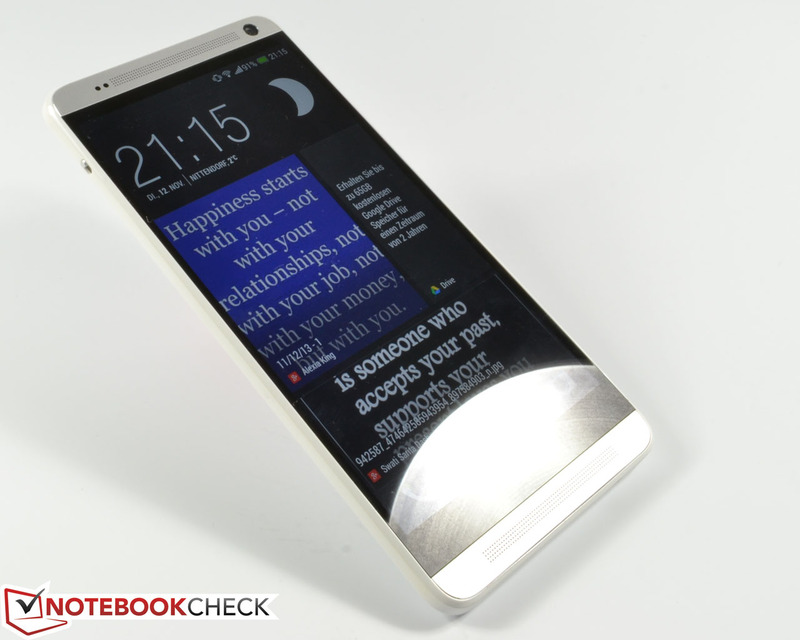 Contenders like Samsung's Galaxy Note 3 or Sony's Xperia Z Ultra already feature this. 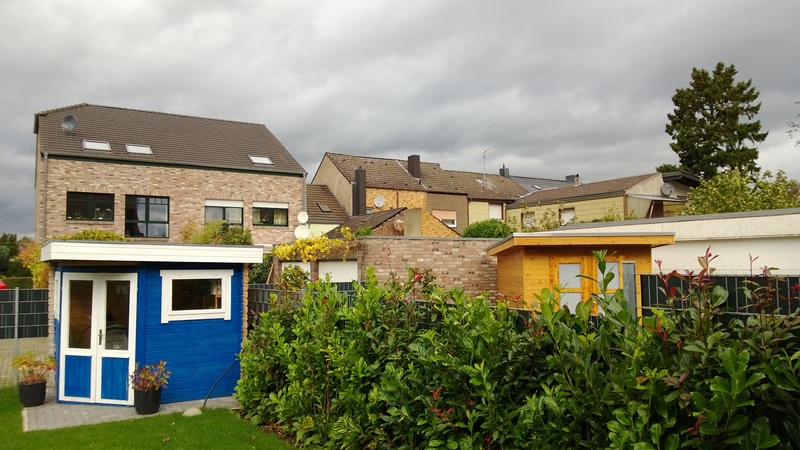 Besides that, the UltraPixel camera did not completely convince us. 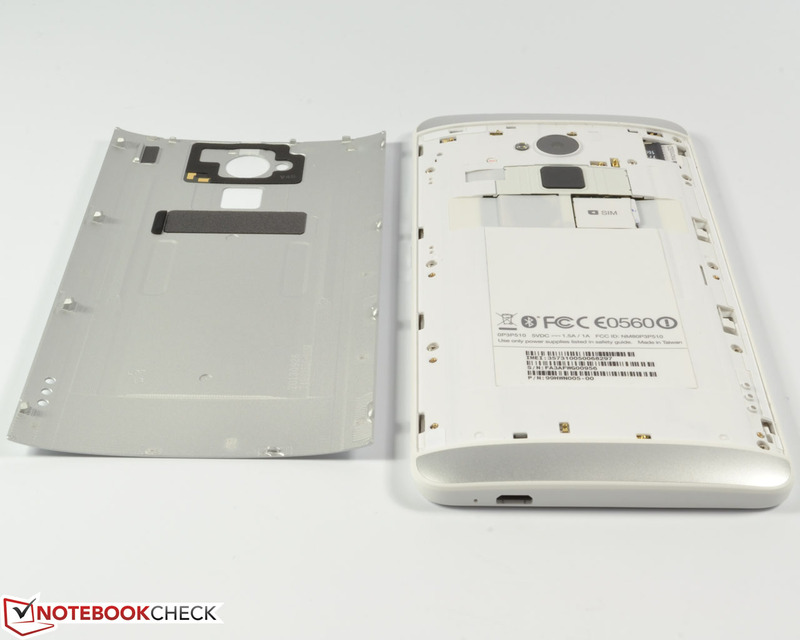 Also, if the back cover can be taken off, it should have been possible to implement a removable battery. 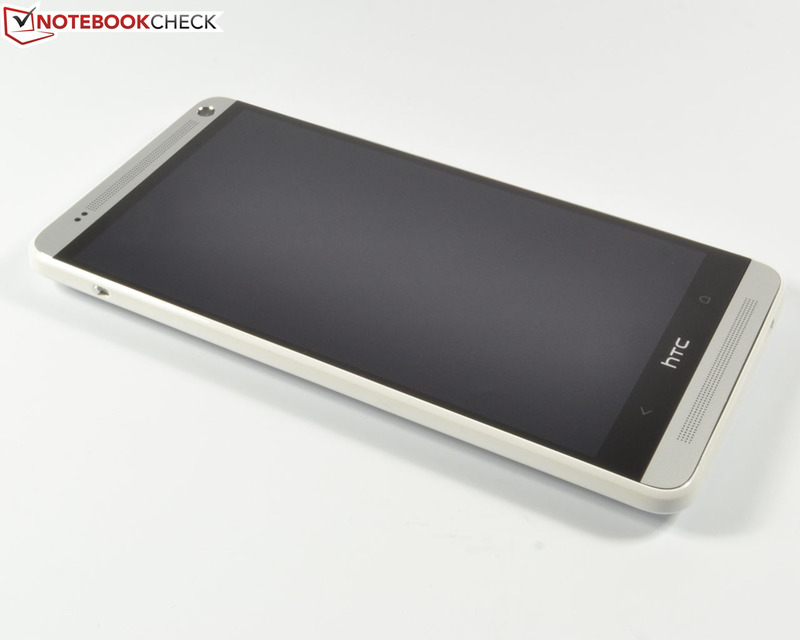 All in all, HTC has designed a very good phablet with the One Max. It has a few shortcomings and many advantages. However, its present price is approximately 660 Euros (~$890, RRP: 699 Euros, ~$943). The contenders, such as Samsung's Galaxy Note 3, are available for a current street price of about 550 Euros (~$742); Sony's Xperia Z Ultra costs 560 Euros (~$755). 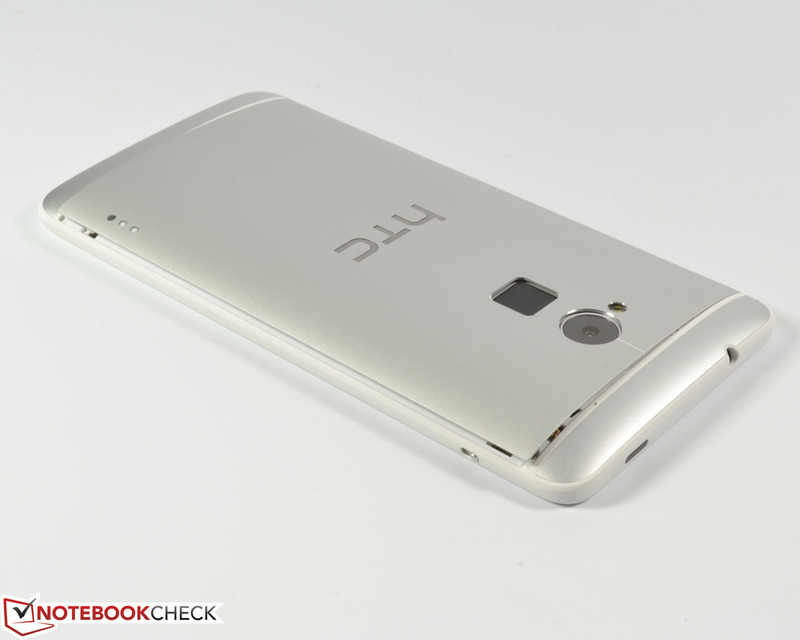 In Review: HTC One Max Smartphone, courtesy of HTC. 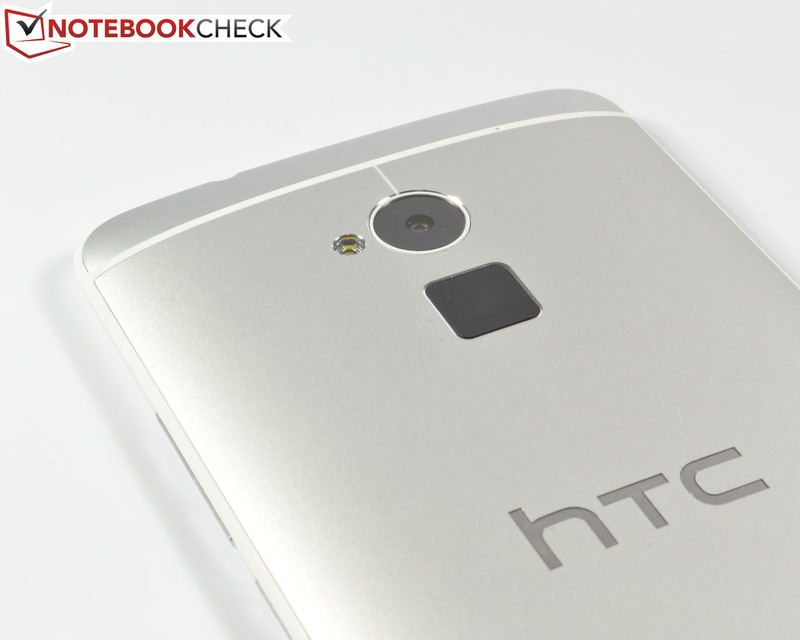 In review: The HTC One Max phablet. HTC's One Max comes with standard accessories: Quick-start guide, a modular charger including USB cord and in-ear headphones. Its elegant exterior and high-quality feeling materials are appealing. 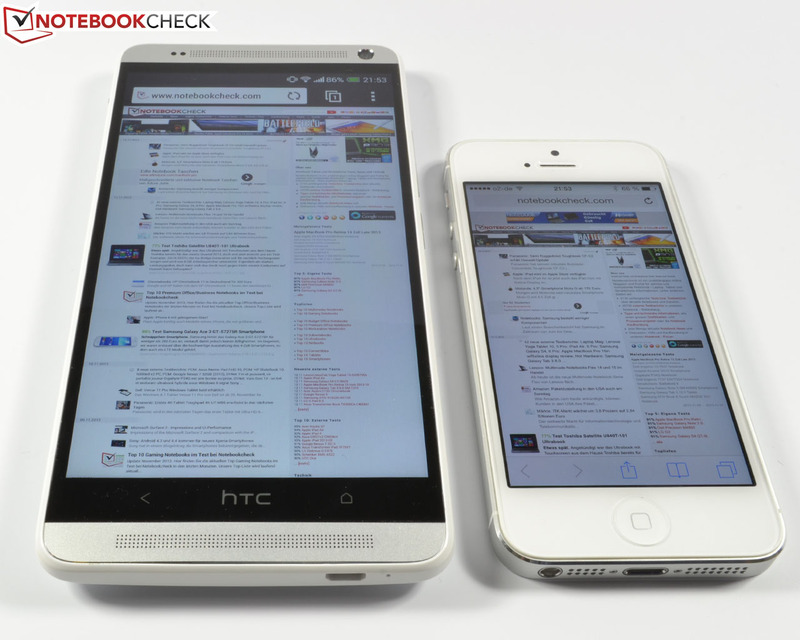 ...HTC's One Max looks gigantic. The large touchscreen is fast and reliable. 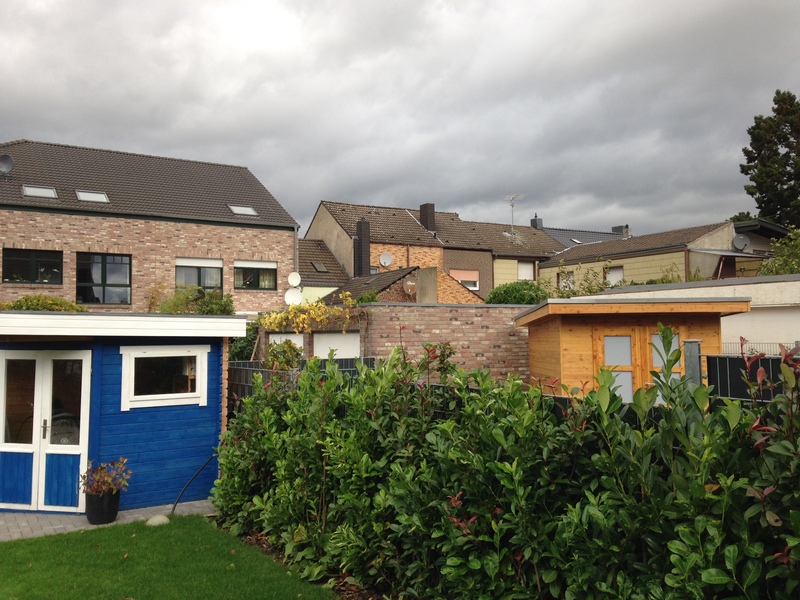 ...but needs about half the screen in landscape mode. 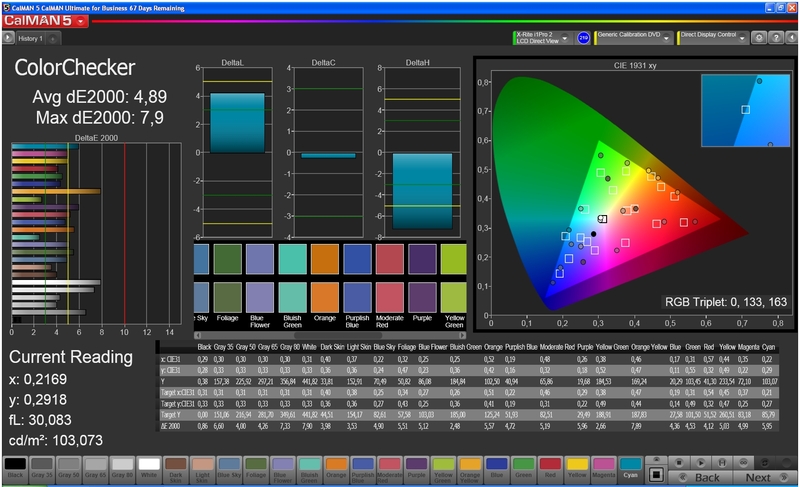 The IPS screen reproduces content with high contrasts and brilliant colors. The glossy surface causes intense reflections in direct light. There is a lot of room for apps on the gigantic screen. 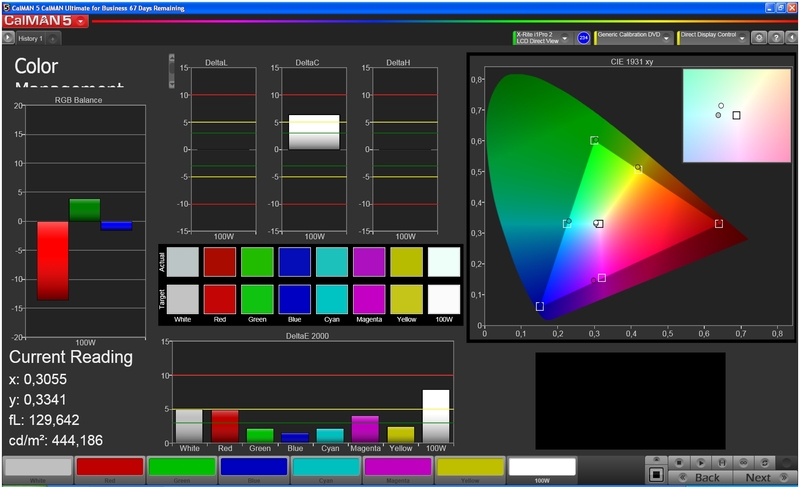 The automatic brightness control can be adjusted. 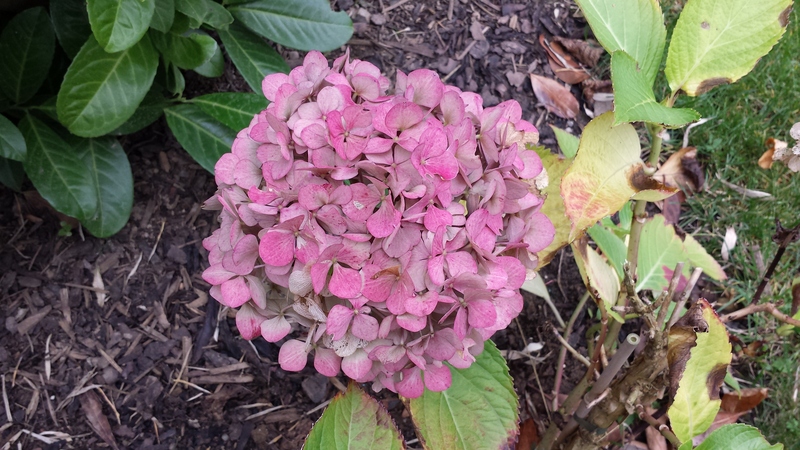 The white image does not exhibit any discoloration. The camera modules are the same as in HTC's One but the One Max does not have an image stabilizer. A five-level LED flash lights up darker surroundings. The phablet features all necessary interfaces and is well-equipped. 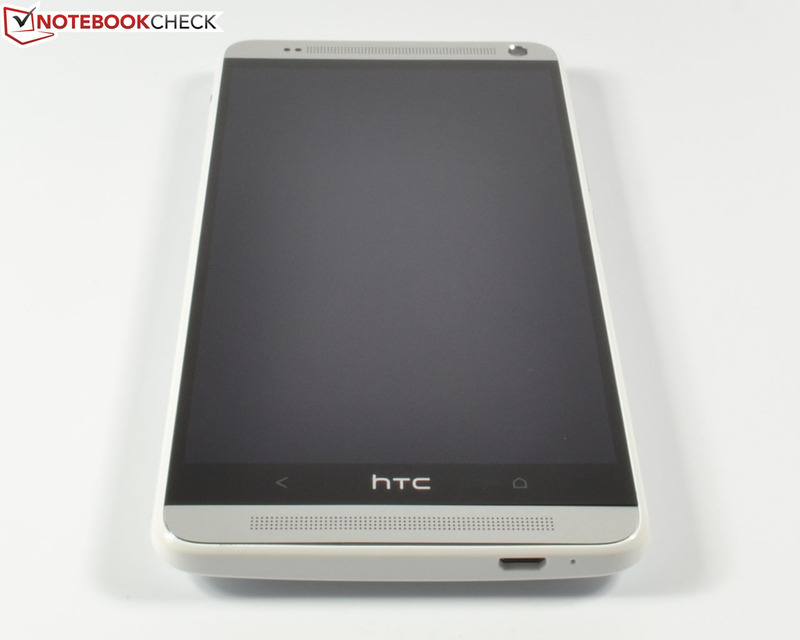 Even an infrared interface for controlling a TV or stereo system has found its way into HTC's One Max. The stereo speakers really rock. Considering their size, there is currently nothing better. We noticed marginally uneven gaps on the lower speaker cover in our review sample. The removable cover also sometimes causes irregularities. ...there is a micro-SD port for expanding the internal storage. The 3300 mAh/12.54 Wh battery is strong enough, but unfortunately not removable. Wasted potential. The phablet's back remains relatively cool despite the high-performance components from Qualcomm - even during full load. The AnTuTu v4 benchmark verifies the One Max's very good performance. Useful apps like YouTube, Facebook or Twitter now belong to today's must-haves. Google Chrome can be used should the Android browser become too sluggish. The big, bright screen and the great stereo sound. Also, the long battery runtimes and micro-SD slot. A removable battery and black as an optional color would be appreciated. 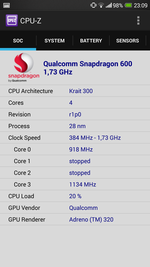 Besides that, the latest Snapdragon 800 SoC. 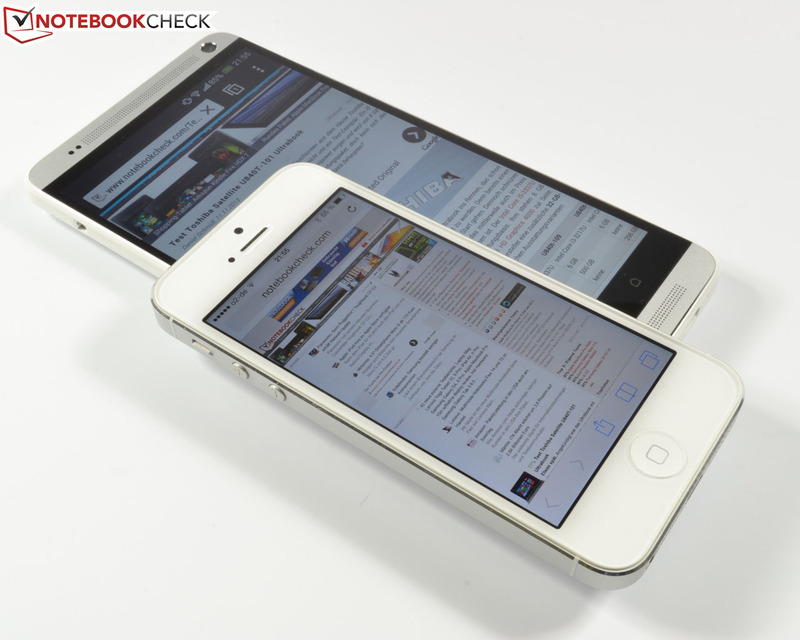 How handy the phablet is despite its gigantic size and how soon we got used to it.